Kodai and Shima look at the old rusted hulk, wondering why the Garmillas would be interested in it. Suddenly, they hear the whine of engines above them. A flight of Garmillas bombers descends upon them. [LC]: Like the previous episode, there is no opening credit sequence and the title logo is superimposed over the opening shot. Unlike the previous episode, this one starts immediately shuffling things around. 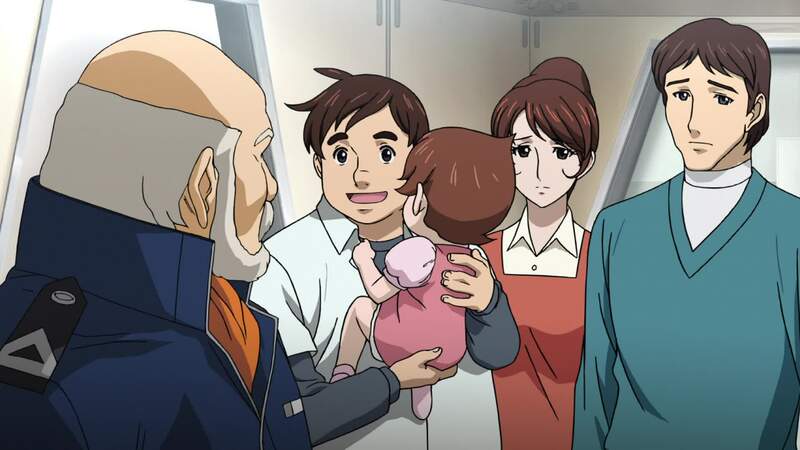 It starts exactly where episode 1 left off but with events which, in the original, take place about halfway through the episode, long after Kodai and Shima have already been rescued and when they have already been taken aboard the Yamato. As we’ll see, in stark contrast to episode 1, which was an almost verbatim version of the original, this episode makes quite an exercise in taking the best plot points of two episodes, in this case the original episodes 2 and 3, and discarding a lot of filler. This tightens the story into a more logical flow while at the same time adding its own new plot points, an approach that will become another of 2199‘s strengths. 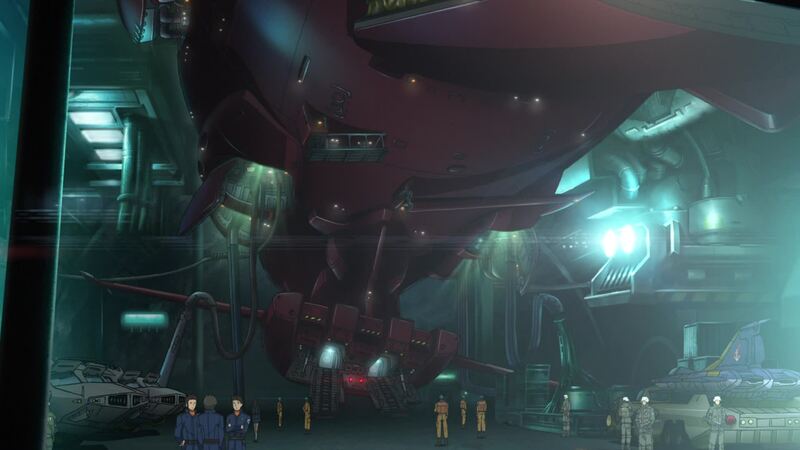 [DG]: These aircraft are designated DWG-229 Melanka in Yamato 2199. The aircraft and the model number were inspired by the Horton Brothers-designed Ho-229 (often referred to as the Gotha Go-229), the first twin-jet engine pure flying wing aircraft, first built in 1944. This continues the trend seen in Episode 1 with the FG-156 Sumaruhi version of the design, with the designation and/or purpose of the plane matching those of World War 2 German aircraft. The Melankas fire their compliment of missiles at the old wreck, much to the two boys’ confusion. As it descends from orbit, a Polmeria Class carrier launches a second wing of Melankas. Meanwhile, in an underground bunker, a group of UNCN officers listen to an announcement advising them to stay in the shelter. Some are unsure of their safety but one of the officers is adamant in his resolve to board the ship. Wondering where the bombers might be coming from, Kodai spots the descending Polmeria with his field binoculars. As it hovers above the site, the Polmeria unleashes a powerful energy beam which sweeps across the area. Whether by design or by chance, the beam strikes the bunker, killing everyone inside. 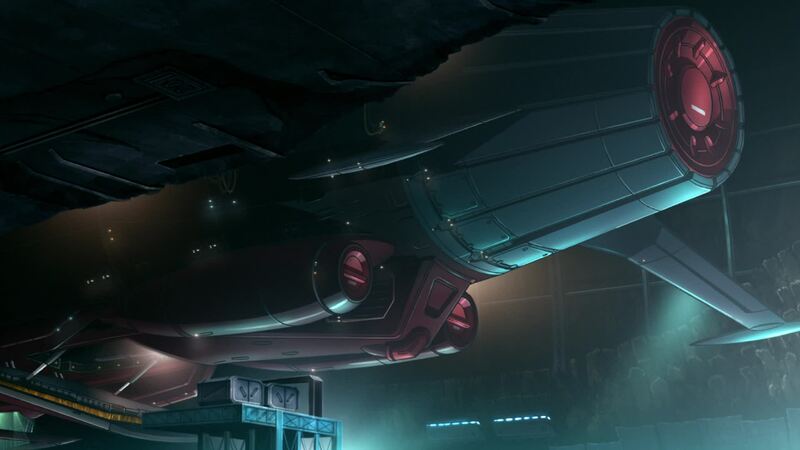 [LC]: The underside of this ship always looked like it housed some sort of weapon but it was only in 2199 that it actually made use of this feature. According to reference materials and staff interviews, the technology of the Polmeria-class Carrier comes from an entirely different system, conquered by Garmillas. 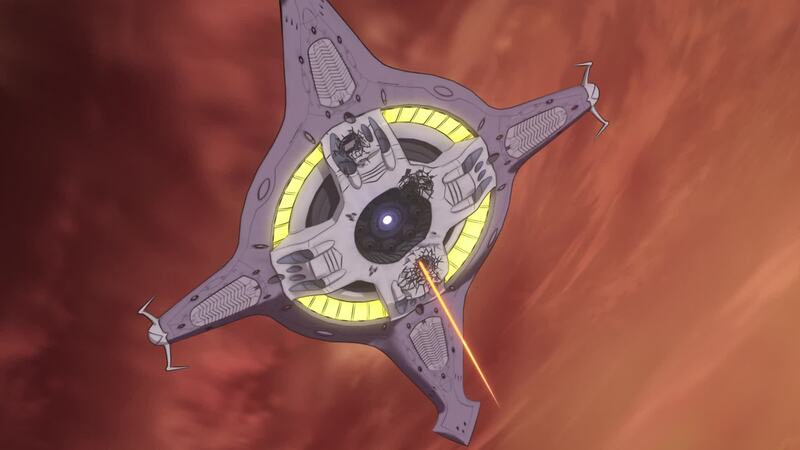 The star shape itself makes it different from the other ship’s designs but the armaments have different power and technical systems. 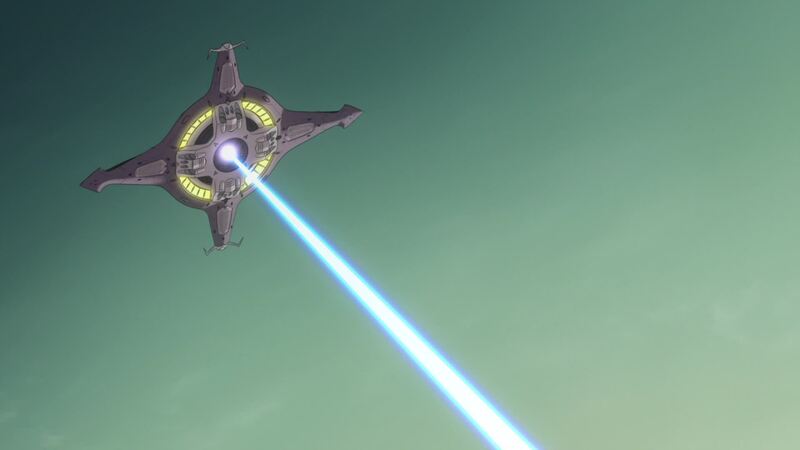 From what we see on the show, it constantly spins around its axis, except when it launches its compliment of fighters (and presumably when it collects them). Another interesting detail is that, despite its slender look, the Pormelia is actually quite a big ship, measuring 383.8 meters at its widest point, making it longer than even the Gaiderol-class Dreadnaught. On a purely conjectural note, renowned model maker Naoto “WildRiver” Arakawa made a modified and super-detailed model – which can be seen in Report 25 – where he makes the assumption that the 4 domes on the top of the craft are used to load the bombers aboard, also showing an intricate system to store, position and launch them. No such scene appears on the series or reference is made to it in any materials but he makes it make sense. Suddenly, the shipwreck comes to life, one of its gun turrets turning and targeting the Polmeria, which prepares for another volley. Before it can open fire, the earthbound ship unleashes a salvo of three shells which hit the carrier, destroying it. 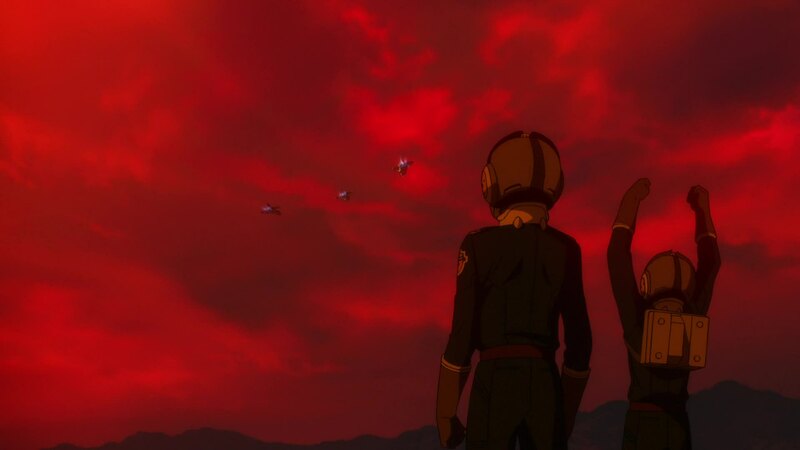 Kodai and Shima gasp in wonder as the remains of the Polmeria rain from the skies. 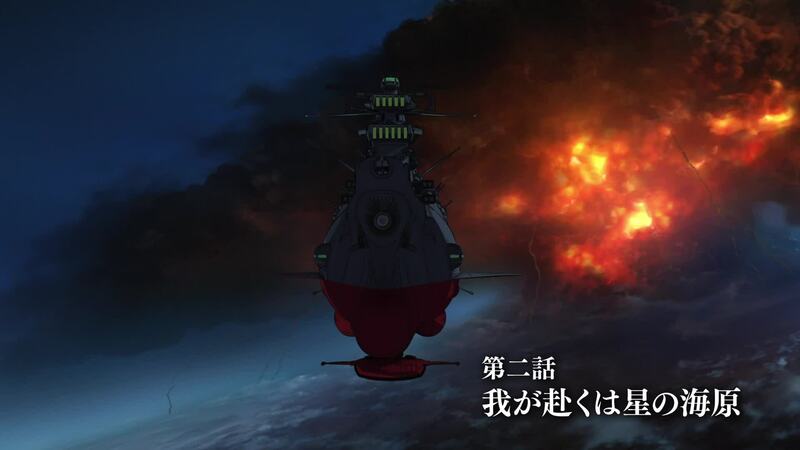 [DG]: Here we see Yamato fire her guns for the first time. In a notable divergence from the original series, Yamato launched from the ground to engage the carrier, and fired its shock cannons. This time it remains in its rocky protection, and merely rotates the #2 main turret, trains its guns on the carrier, and fires upon it from the ground. The other major diversion is that the turret fired shells instead of beams. 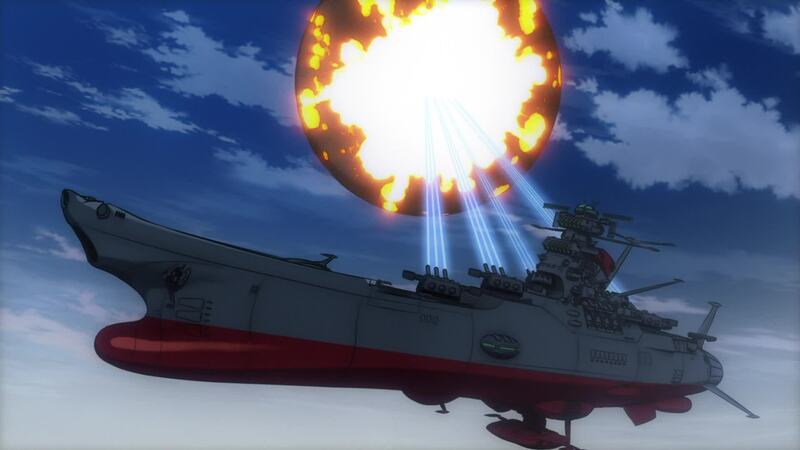 The first, but certainly not the last time we will see this new capability of Yamato‘s guns. A minor animation blunder here in that we see the #2 turret turn around to face the target, but after they switch the camera over to the approaching Polmeria, they return focus to Yamato and it’s bringing its #2 turret from the forward-facing position again. 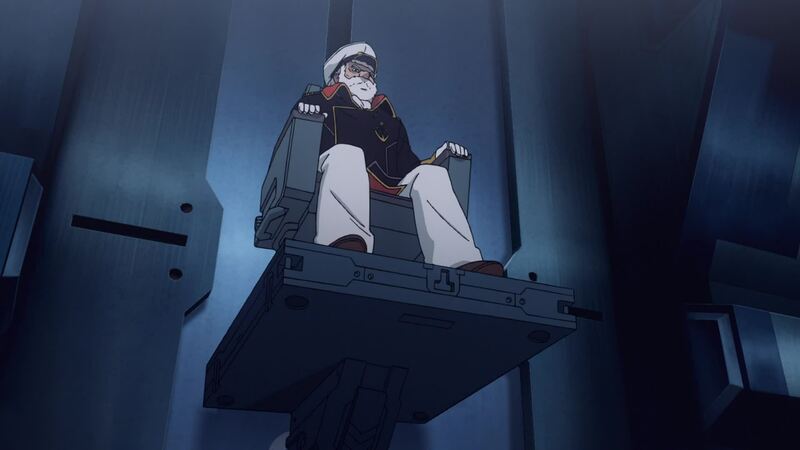 [LC]: As i said at the top, in the original, this attack scene starts at the end of episode 2’s first act, after the main characters had already boarded the Yamato, though at that point it’s only Okita, Kodai, Shima, Yuki, Analyzer and Sado, alongside a skeleton crew. 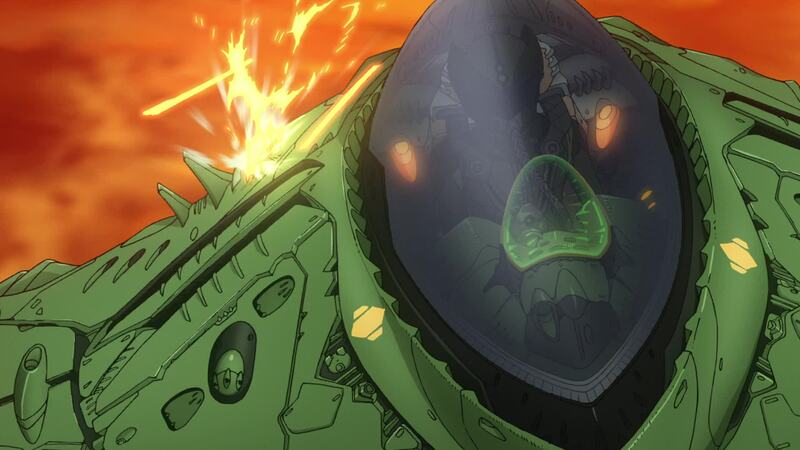 Yamato breaks free from its camouflage and takes off, using the shock cannons to destroy the Pormelia (an error, since the Wave Engine is only activated in episode 3). Given that none of that has happened yet in 2199, this is quite an elegant solution. 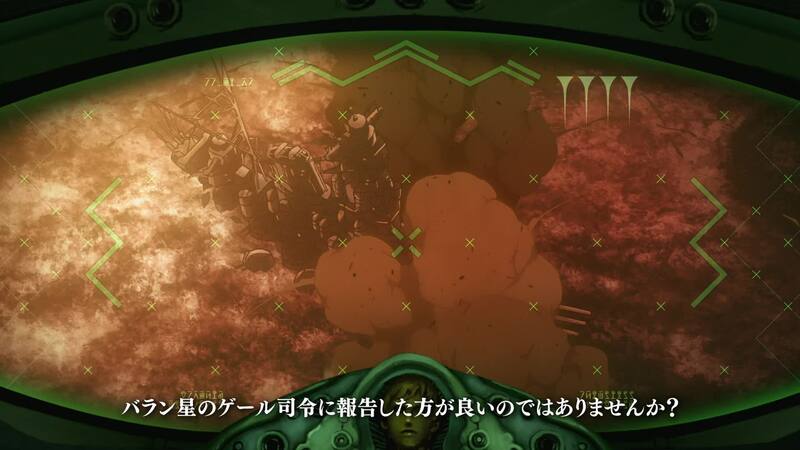 The use of Type III rounds was explained by Director Izubuchi; since the Wave-Motion Engine has yet to be activated, the shock cannon function can’t be used, as those are powered by wave-motion energy. It’s good to see that, even without Wave Energy, Yamato is now far from powerless. The name “Type III Shells” (San-Shiki-Dan) was chosen by Director Izubuchi. It was a type of time-fused anti-aircraft shell used on the IJN Yamato. 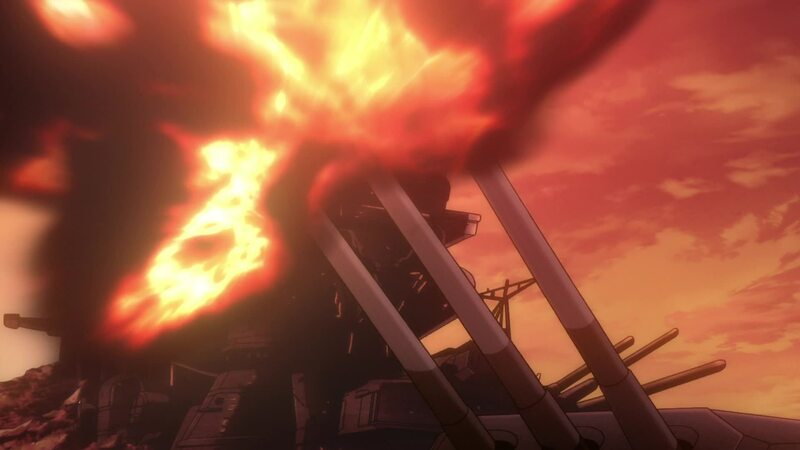 Izubuchi said he went with it because the name sounded good, though Takashi Imanishi (CGI Director) pointed out that Yamato‘s standard artillery shell was actually the Type 94. It should also be noted that only the forward gun batteries have the capacity to fire these shells. 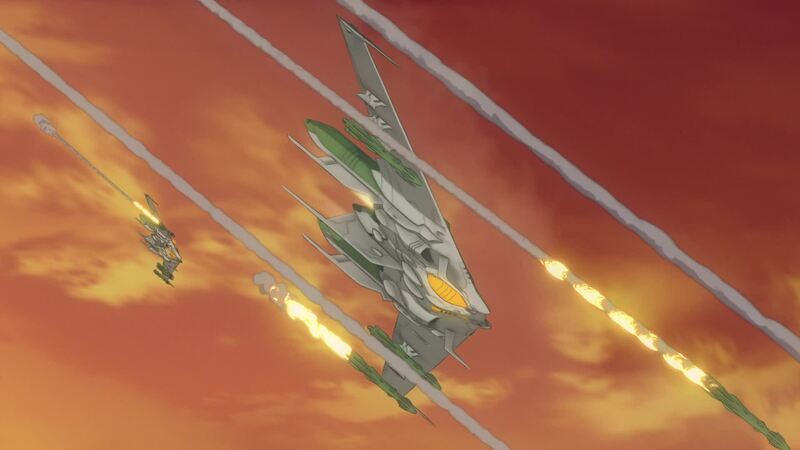 The Melankas, which were returning to their carrier, find themselves under attack, as Kato and two wingmen proceed to dispatch them. With no missiles and seriously outgunned, the bombers are no match for the Cosmo Falcons. [LC]: Though it’s hardly recognizable, the original Black Tiger fighter design is the base of the Cosmo Falcon design, updated to more contemporary trends and complying with more current combat aviation technologies. Think of them as a “Steath Tiger”. As for the name change, it seems that in Asia these days the term “Black Tiger” is more commonly associated with a popular kind of shrimp. The Japanese word for (Peregrine) Falcon is Hayabusa. The name follows the Nakajima Ki-43 Hayabusa fighter plane that was the pride of the Japanese army. The association of Yamato and Hayabusa runs deep. How deep? 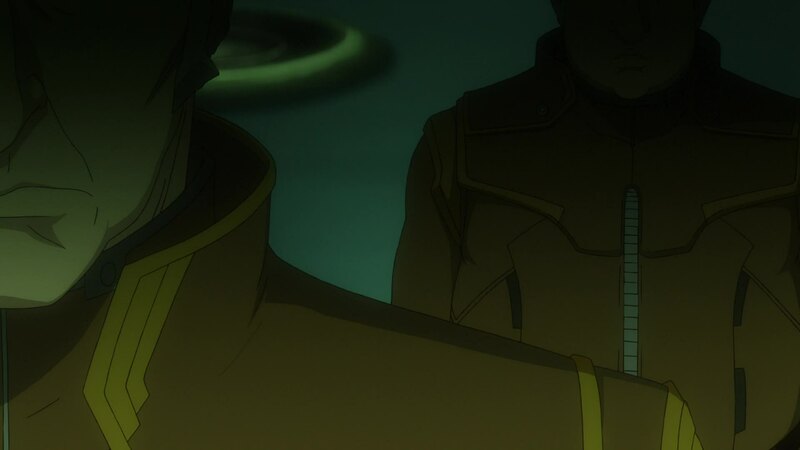 In Yamato‘s early development, the arrow insignia of the 64th Army Air Combat Regiment found its way onto the front of the crew uniforms in the anime. In accordance with this historical background, the Falcons belong the UNCF (ground forces or army) as a carrier-based combat attack aircraft, developed and mass-produced by the UN ground forces. Since the old Hayabusa was an army fighter, then adopting the name gains even more significance. 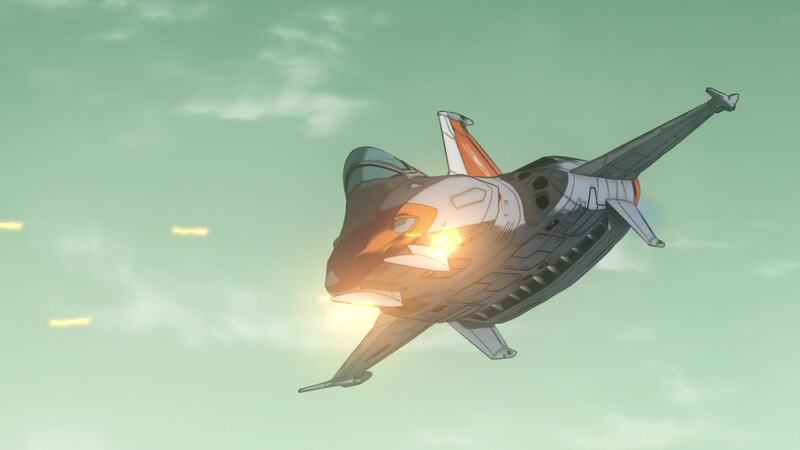 [DG]: We see that the Cosmo Falcon has an array of three shell-firing cannons in the wing root (as opposed to the original series’ Cosmo Tigers, which had beam weapons) as well as missiles stored in internal bays, much akin to the F-22 Raptor. It also has two machine guns in the ventral side of the nose. Makes me wonder what kind of ammunition capacity they have, or where it stores all this ammunition. When the mop-up operation is finished, Kato is ordered back to base. 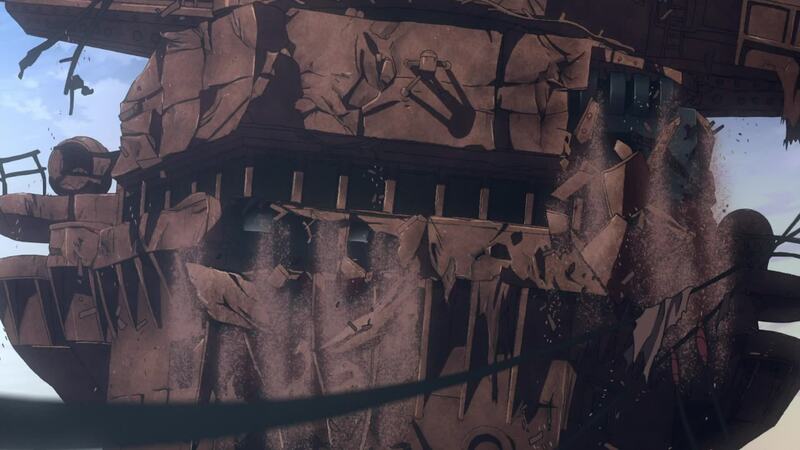 As his wing overflies the Yamato, he spots Kodai and Shima, sighing “idiots!” As Shima waves his fists in protest for the lack of assistance, Kodai ponders the events they just witnessed and comments: “it’s alive…this rusted old ship”. [LC]: This scene is not just the first where we see the Cosmo Falcons in action but also our first glimpse of a Garmillan; one of the Melanka pilots is briefly seen as his plane is hit. 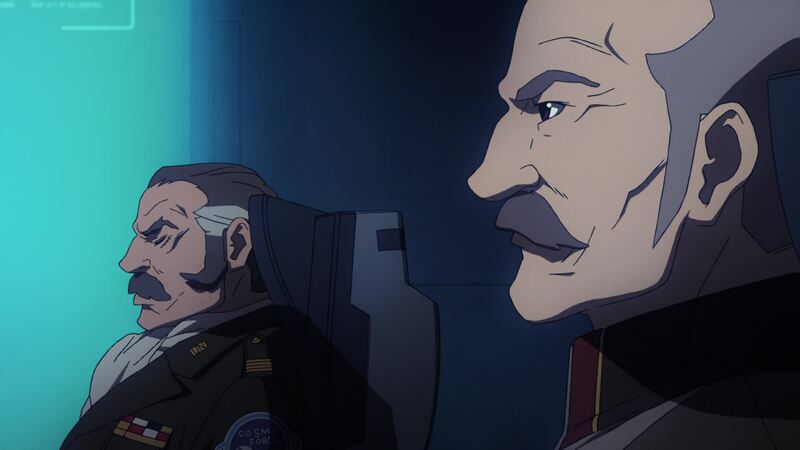 At Pluto, Colonel Valke Shultz and his second, Major Gelf Ganz, observe the video transmited from the Polmeria before its destruction. 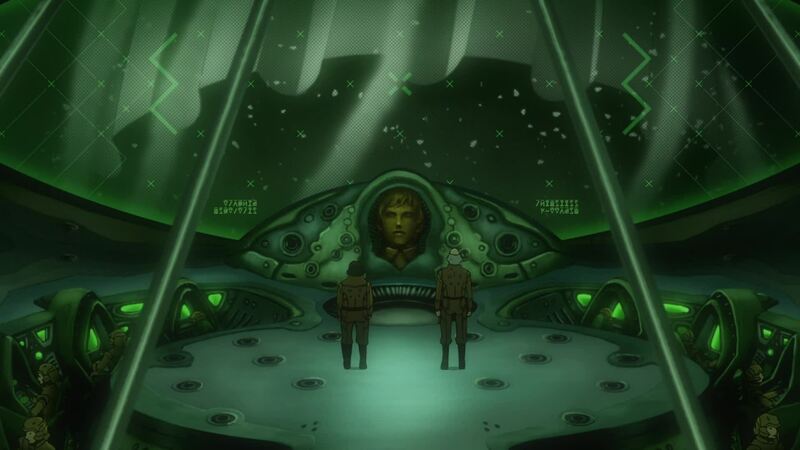 Though Ganz wonders if this should be reported back to commander Goer on Planet Balun, Shultz decides they’ll resolve the matter themselves, questioning what would happen if “opportunist” Goer reported the loss of the carrier back to headquarters. He orders an Interplanetary Balistic Missile to be readied for launch. 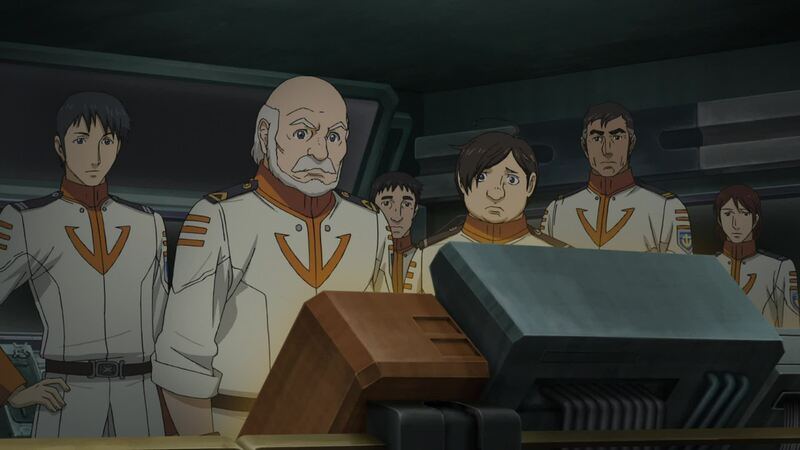 [DG]: Here we see our first Garmillan characters from the old series, Schulz (confusingly Ganz in Star Blazers) and Ganz (Bane in Star Blazers). Rather than the arrogant base commander we see in the original, here Schulz’s personality is more that of an officer on the outs with high command, which is, as we will find further on in the story, all too true. 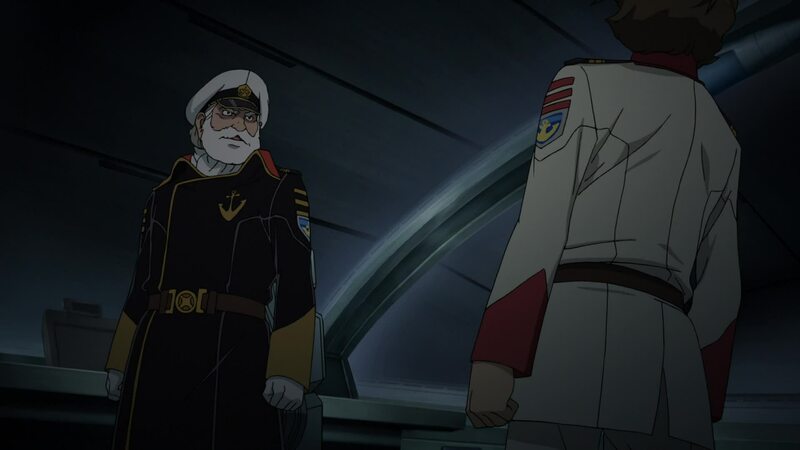 There is also mention of Goer (Geru in the original, Volgar in Star Blazers), who we first heard of much later in the original series when he was replaced as Balan commander by Domel (Lysis). Between Hijikata’s presence and the mention of Goer that they’re making a much greater effort to flesh out the story and give these characters more of a background. With Goer especially, this is important. In the original, they spend a lot of time painting him as an incompetent twit. In 2199, they prove that along the way on more than one occasion. [LC]: Continuing the scene shuffling, this scene nearly matches the start of the original Episode 3, with Shultz and Ganz reviewing the Pormelia’s attack. 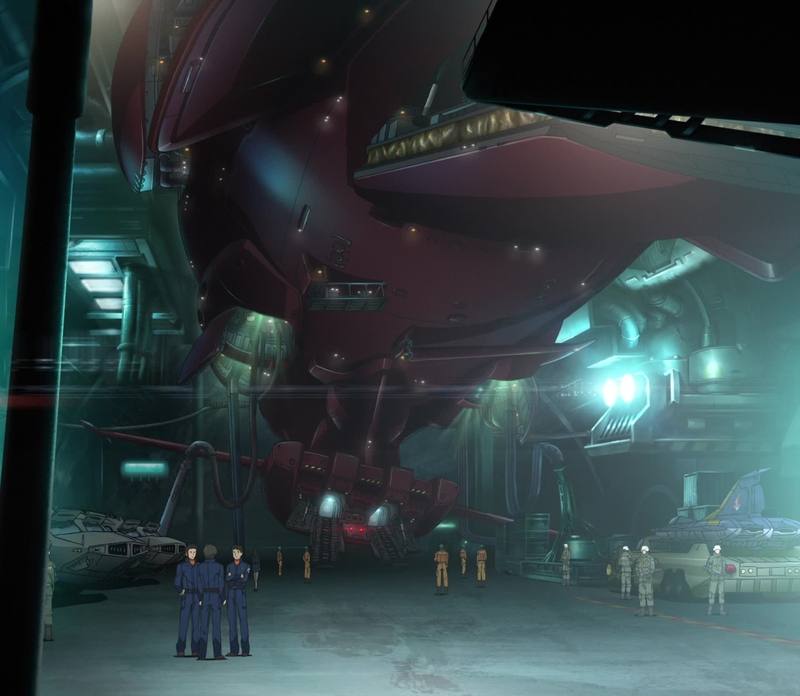 In that version they were urged by Dessler (only his voice coming from his effigy below the screen – which is still there in the new version) to continue their attack and launch the missile. 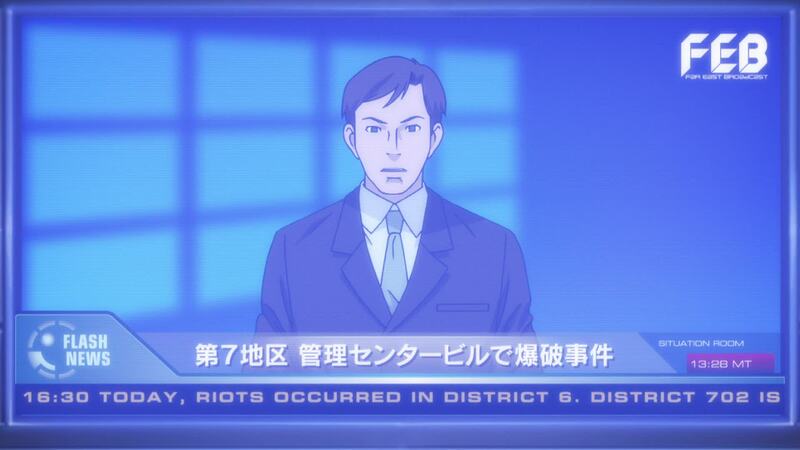 It’s also worth noting that this scene is spoken entirely in Garmillan, and Japanese subtitles appear at the bottom. Aside from the standard phrases such as “Zar Belk” (which we hear for the first time in this scene), it’s the only time we hear Schulz and Ganz speak in Garmillan. Unlike the original, they went to the trouble of creating an entire language for the Garmillas people. Of relevant note, though these Garmillans appear mostly shadowed, we see their skin is pink as in the original. As longtime fans know, the Garmillas were initially the same color as humans. When the decision was made to make them blue, in order to better distinguish them from humans, the Pluto arc was already done. The issue of changing skin colors was dealt with as described here. 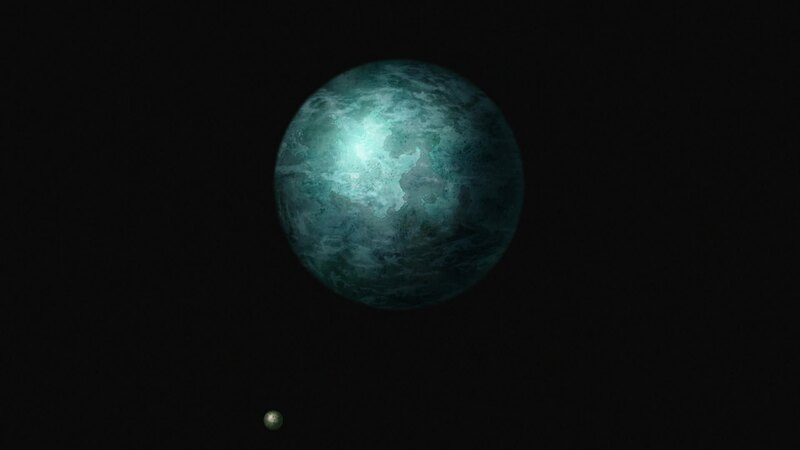 When the story was adapted for the Playstation game in 1999, the Pluto personnel was “corrected” to have blue skin. 2199 tackled the issue differently. Instead of going along with the obvious coverup that special room-lighting made the Garmillans look pink, they actually are. However, they are not true-blooded Garmillans, instead being referred to as 2nd Class Garmillans; people originated from planets conquered by the empire and who are now employed in its service. More precisely, Shultz, Ganz and those stationed at Pluto hail from the Planet Zaltz. More on this in future episodes. Kodai and Shima are checked out by Dr. Sado, though they show more signs of an encounter with Kato’s fist than from radiation exposure. As Shima looks behind them, where Kato’s offending fist is being tended to by nurse Harada, he’s met with Kato’s glare. 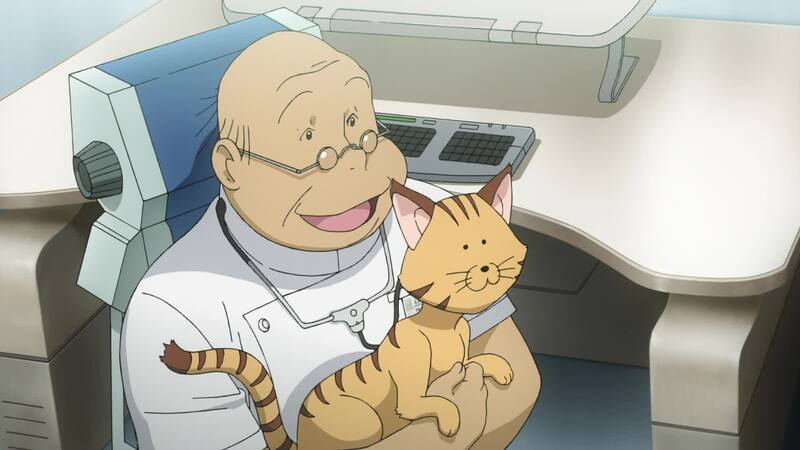 As Sado pets his cat, Mii-kun, he asks Kodai, Shima and Kato if they’ve been called in, too, which Kodai confirms. 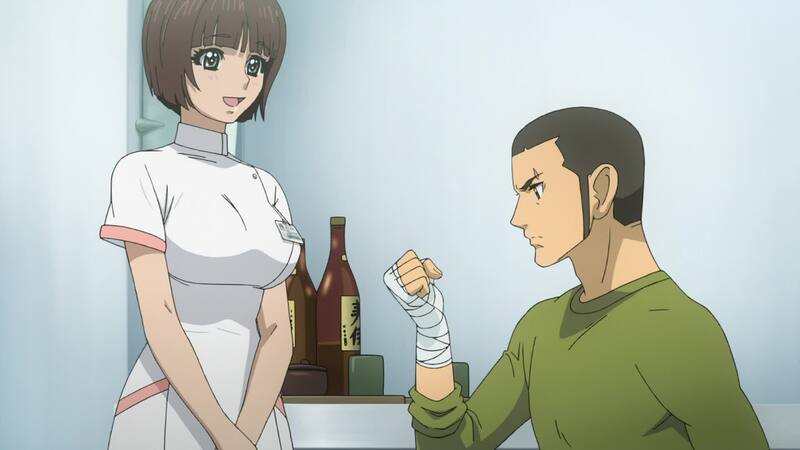 An additional gag in these early episodes is Kato’s short fuse, often placing him in Harada’s care to tend to his “fist of justice”. 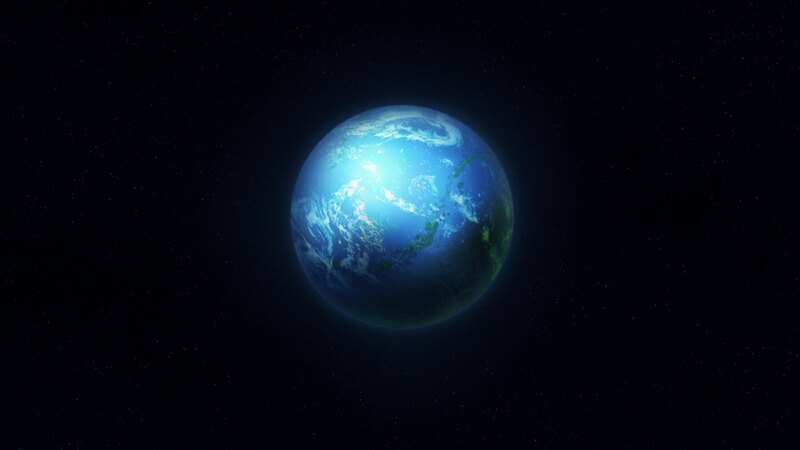 It should be noted that, although references to radiation were made here and in Episode 1, unlike the original series, where the Earth was dying from “radioactive polution”, the production staff has clarified that in 2199, Earth’s demise is being caused by “environmental remodeling by Garmillas”. 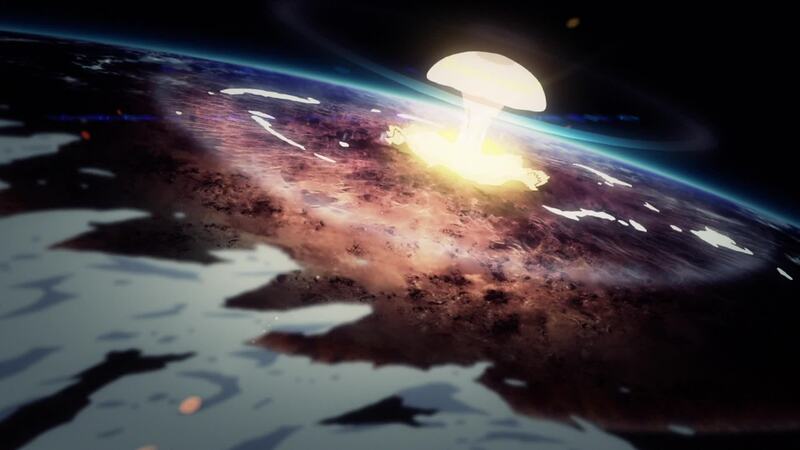 Though harmful radiation levels have been established on the surface, it is only a tool to allow the biological elements seeded by the Planet Bombs to flourish. Though it seems somewhat irrelevant which one kills us, radiation or biological hazards, it is meaningful in that radiation is no longer a blanket term that kills everything (or creates super-heroes). It also deals with the fact that, if it just radiation, even if you have the means to remove it, what then? You have a radiation-free dead world. Kind of a strange thing to go looking for from the start! In this new framework, what is obtained from Iscandar is the means to regenerate (or Reverse) the destroyed environment. 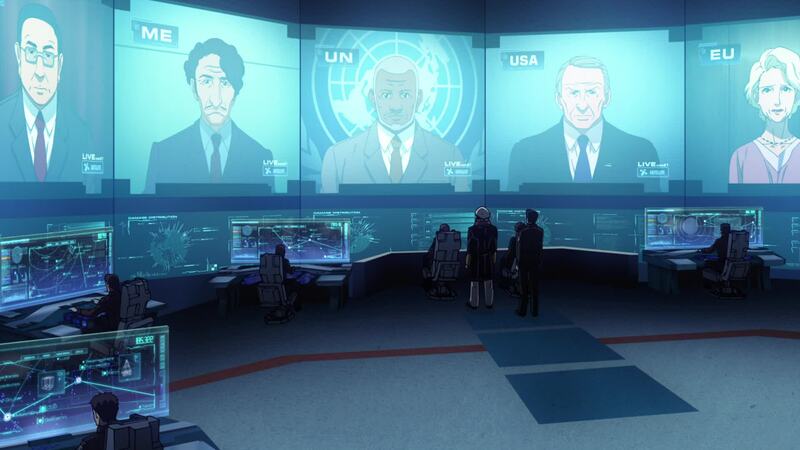 At HQ, Chief Todo, Okita, Sanada and Serizawa are in a tele-conference with the leaders of both the UN and the remaining sectors, regarding the deteriorating conditions in the underground cities and progress of the Yamato Plan. Okita states that, due to the earlier events, launch time has been advanced and will take place within the next 72 hours. 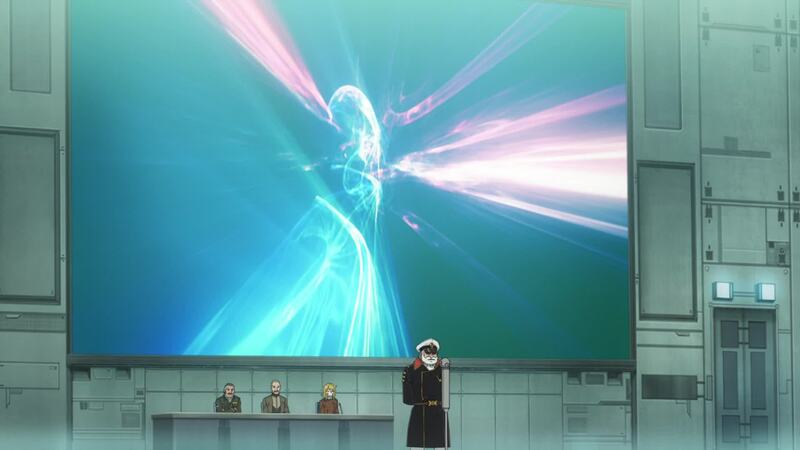 [LC]: In the original series, the very first scene of Episode 2 showed Okita receiving dire reports of sectors around the world falling into chaos and shutting down. This scene mirrors that one, but it’s not as pessimistic. Sure, the world is still going down the drain, but we don’t get the sense everyone else is dying and leaving the Far East Sector alone in the world. Despite the many problems, society is still working. If anything, this adds to the sense of urgency the show, as it gives the world of 2199 a more global feeling. 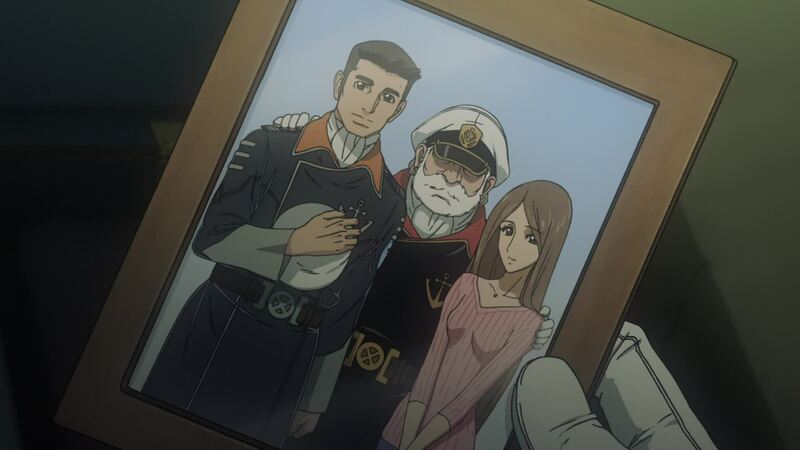 This also serves to explain why most – if not all- of Yamato‘s crew is Japanese. All sectors are now physically isolated from each other, making the transit of resources and personnel impossible. When questioned about the attack and the report that most of the section chiefs were killed, Okita denies it, prompting a silent look from Sanada. When the Middle East sector leader hails his confidence in Okita, the Hero of Operation K2, a visibly irate Serizawa grunts. [DG]: Two things to note here: (1) Okita says they’re setting sail in 72 hours. It doesn’t seem that three days pass during this episode, so this could be construed as a white lie. However, it might be a translation issue and he meant that they set sail within 72 hours. (2) His response to the US President that there were no casualties in the bombing is a downright lie. We see many of them die in the bunker explosion, most of them officers. I put this down to Okita telling them what they need to hear, and what will allow the mission to proceed expediently without objection from the UN. [LC]: Sanada’s reaction to Okita’s lie immediately denotes his loyalty to the admiral and his understanding that it’s not done out of malice. It is merely an attempt to maintain the sense of hope the Yamato Plan conveys. And honestly, telling them the truth would accomplish nothing, merely diminishing that hope. Even though he understands the deceit, Serizawa is less than subtle in his derision. This is due to the fact Okita essentially stole his thunder. 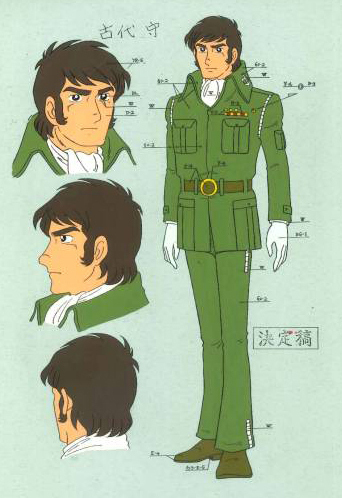 Serizawa was the leader of the Izumo Plan, which was discarded in favor of the Yamato Plan after Yurisha’s arrival. This will play an important part in future episodes. 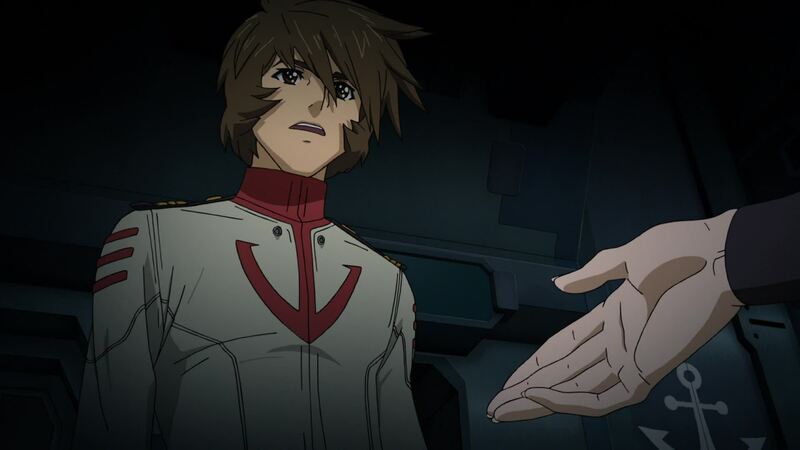 The UN representative regrets more assistance can’t be provided while the European Union leader urges Okita on, as all the hopes of mankind rest upon the Yamato Plan. Okita replies with a wordless nod. [DG]: The UN representative looks somewhat like recent Secretary-General of the UN, Kofi Ananan. The US president bears a resemblance to Alan Dale, who played the vice-president Jim Stockdale in 24. 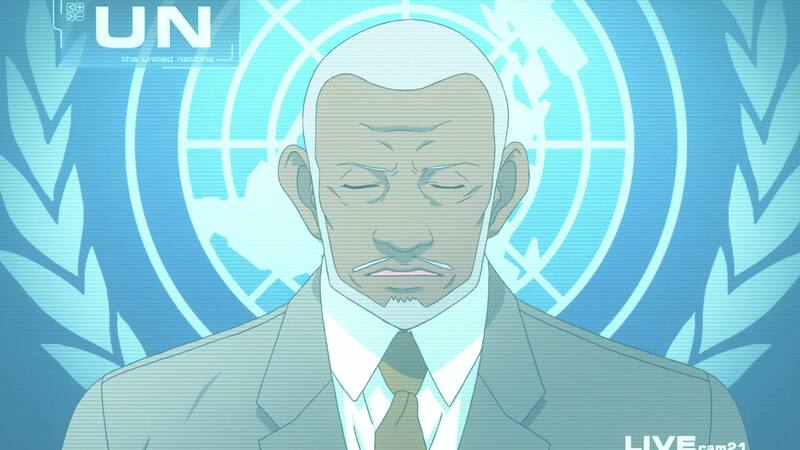 It seems that between the Japanese roundel on the Cosmo Zero in the first episode and the representatives of these nations, there are still political borders across the world just as there are today. [LC]: Though none of the representatives are named on the series, the manga version had a little interesting twist. Not only is the meeting held with only one of them, the female EU representative is referred to as Ms. Eldred. Sound familiar? Returning to Pluto, the Garmillas base there is a hive of activity. Alert sirens are blaring as a missile silo opens, and an Interplanetary Ballistic Missile is launched toward Earth. [LC]: Storywise, from this scene, we jump again to Episode 3 with only occasional returns to Episode 2. The major of these will be discussed when we get to it. 10 = Kes , 9 = Bea , 8 = Pak , 7 = Zek , 6 = Gig , 5 = Gal , 4 = Ji , 3 = Nel , 2 = Beo , 1 = Al , 0 = Zeo . [LC]: The IPBM is probably the most ludicrous weapon in the Yamato pantheon of weaponry. Having a 1500-meter long and 950-meter wide missile might be visually impressive, but lets look at it from a practical standpoint. First and foremost, aside from making a visual statement of power, the weapon’s size makes it tremendously impractical. This thing is bigger than any ship in the Garmillas fleet. 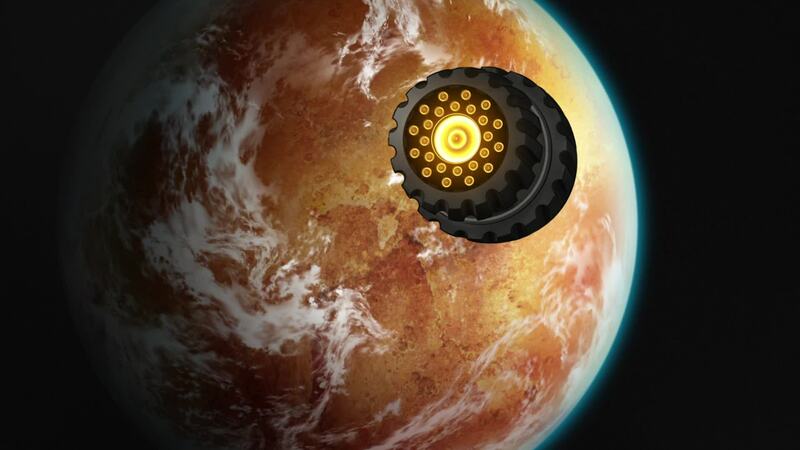 The resources used to build one, just in terms of raw materials, must be tremendous. You’re basically committing a volume of material equal to multiple ships to a projectile that can only be used once. What is the payload of the IPBM? Does it carry some actual explosive charge or is it simply sheer mass that levels its target? 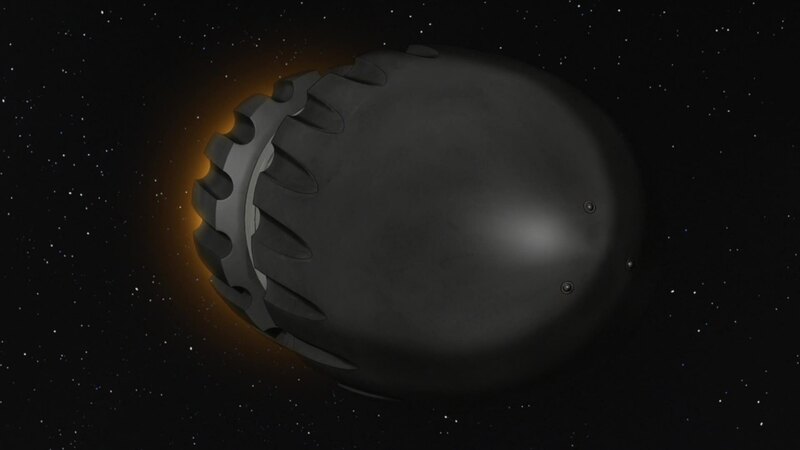 We’ll see the IPBM’s used later in the series, but from that it doesn’t look as if they pack more of a punch than a Planet Bomb, which is by contrast an elegant example of simplicity and resource management. Since we’re on the subject, if you’re going to carry IPBMs around, the same could be achieved with some local asteroids dropped onto the offending planet. So why did they use it at all? 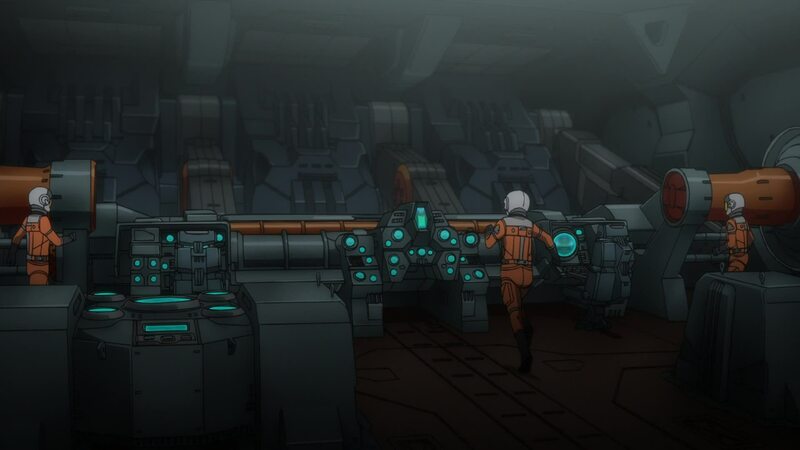 At the end of this episode we’ll see that probably the only redeeming quality of the IPBM is that it looks wicked cool and threatening when rushing toward our hero ship. That’s one of the elements we can only call Yamato-ness. [DG]: This is hardly the last time we’ll see ludicrously large weapon in anime. After all, we see missiles that make this look like a bazooka in Genesis Climber Mospeada (which some readers will be more familiar with as Robotech: The New Generation), where the nearly 3km-long missiles in the final episode dwarfed the 700-meter cruisers which had to physically connect to arm them. There are countless other examples throughout anime of ridiculously large weapons. That’s one of the things that makes it anime. Next morning, a big crowd gathers at the UNCN Far East HQ plaza. 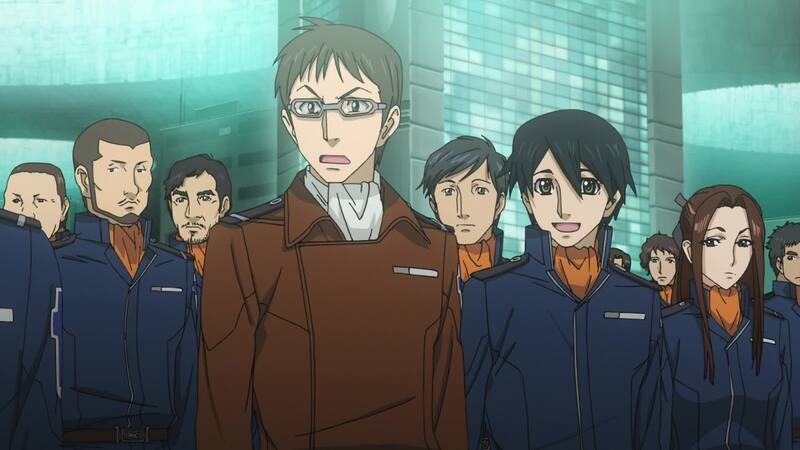 Sanada, Kodai, Shima, Kato and Tokugawa are there, along with new characters Kaoru Niimi and Hiroki Shinohara. Niimi’s attention is caught by two men who think the assembly is to present the Izumo Plan. They seem to disdain the thought of leaving everyone else behind on Earth. Meanwhile, Shima is uneasy since a still visibly-pissed Kato flexes his bandaged fist a few rows behind him. [LC]: This is Kaoru Niimi’s first appearance. Though she has no lines in this episode, everyone knew who she was due to the widely-publicised expansion of female characters. However, this scene and one other, say more about the character than any dialogue she might have been given; we see that she’s quite aware of what’s going on around her and is observant of other people’s behavior, traits that will define her as the series progresses. Okita appears on stage and addresses the crowd. 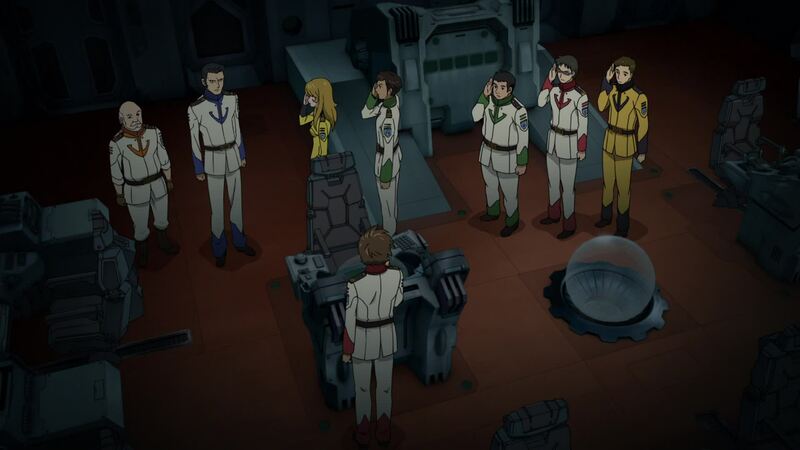 He comments that they were specially selected and trained for the Izumo Plan, and he is there to formally announce their mission. 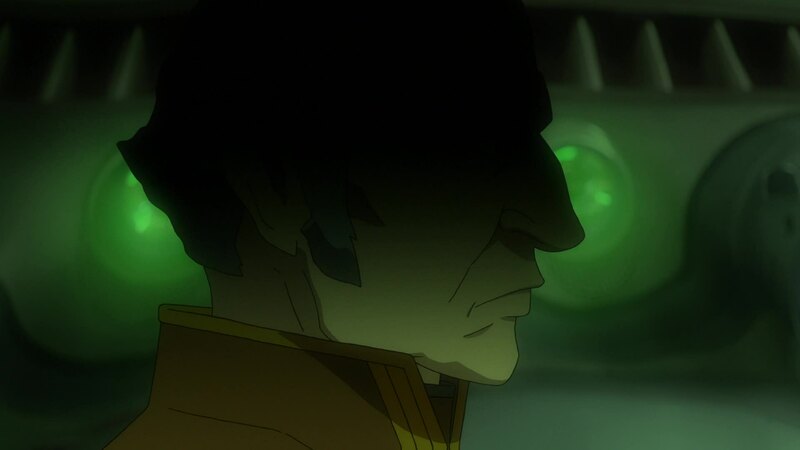 Much to everyone’s surprise, he says the Izumo Plan has been abandoned, assuring them he will explain everything. But first, he’d like them to pay attention to the main video screen and to a message they retreived during “Operation M”. 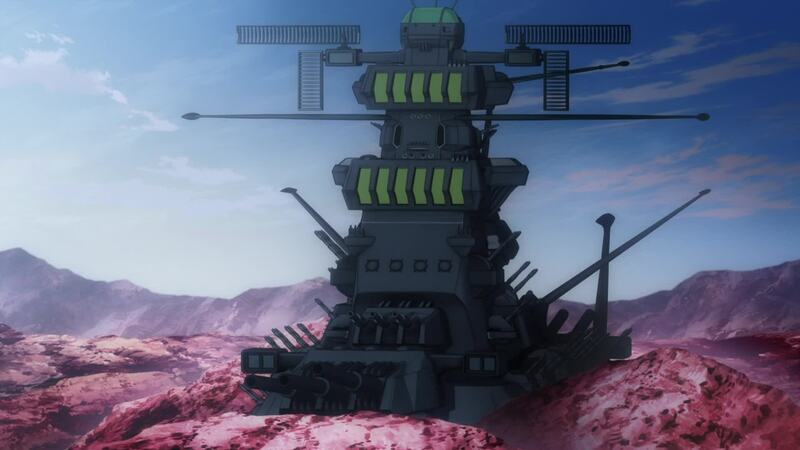 [DG]: Okita saying the video message was “retrieved during Operation M yesterday” could have two possible meanings: (1) That they retrieved the core module itself yesterday. This is unlikely, since even if they traveled from Mars to Earth at the same speed as from Mars to Pluto, it would be 38 hours of travel time. (2) They retrieved the message from the core module the previous day, after the return to Earth. The latter is much more plausible. After all, they would probably have had neither the knowledge nor the facilities to extract the message aboard Kirishima. As such, it’s safe to say that this assembly (and the earlier teleconference with the UN reps) takes place the day after Kirishima’s return. Among streams of colored lights and incomprehensible mathematical formulas, the voice of a woman identifying herself as “Starsha of the Planet Iscandar” echoes through the plaza. She says she is aware of Earth’s plight at the hands of the Garmillas, and that a year ago she sent her sister Yurisha to Earth with plans for a Dimensional Wave-Motion Engine. 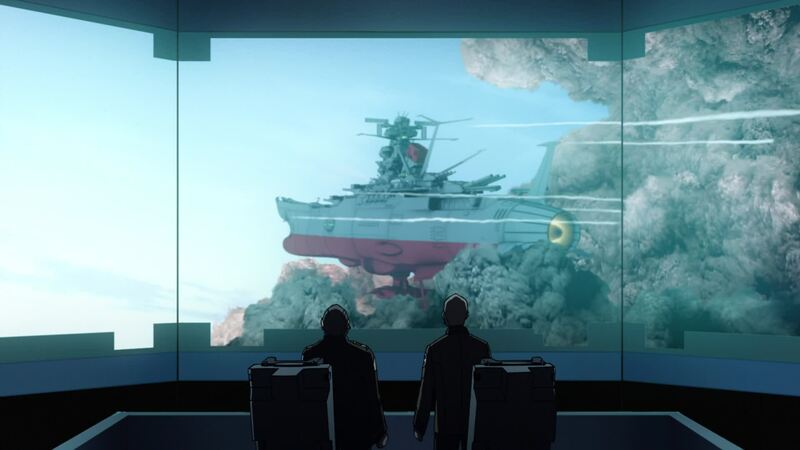 Kodai is surprised at this mention of the enemy’s name, and recognizes the ship on the screen as the one he and Shima saw over Mars. 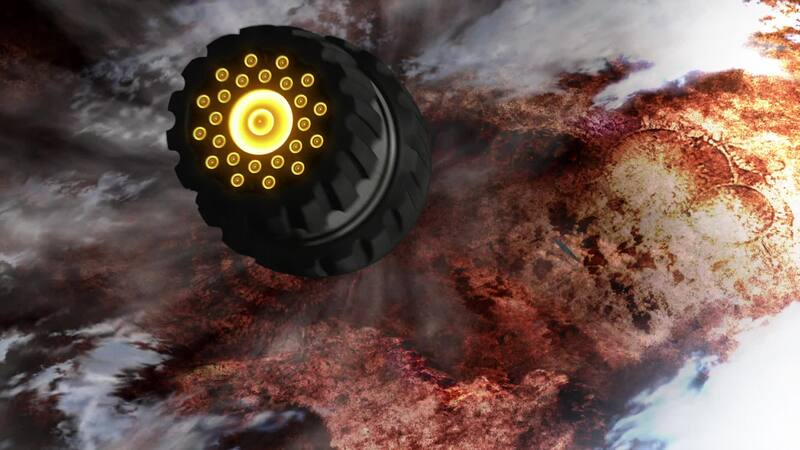 Starsha hopes mankind can understand the plans and build the engine in order to travel to Iscandar, which possesses the technology to repair the damage caused by planet bombs. The crowd is stunned by this revelation. [LC]: Kodai’s reaction to the mention of Garmillas leads us to believe the enemy’s name hasn’t been broadly divulged. Hijikata’s remark in the previous episode leads us to believe not much else is yet known about them. The name itself was probably learned only from Yurisha. 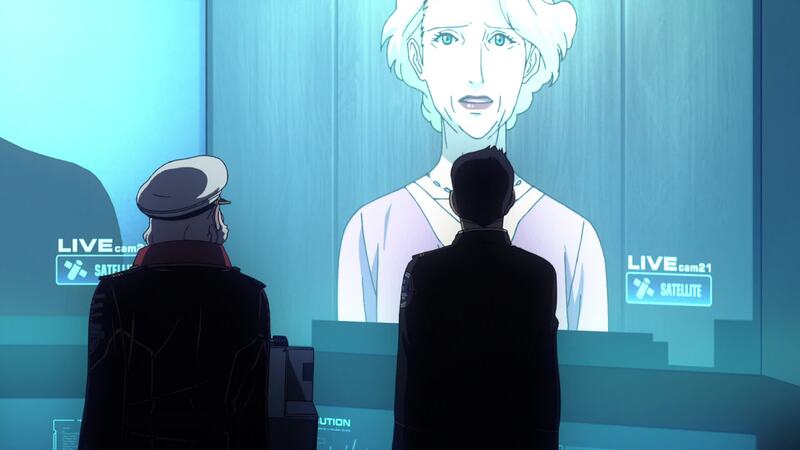 As Starsha’s face appears onscreen, she reveals it is no longer possible for her to send the technology to Earth herself. 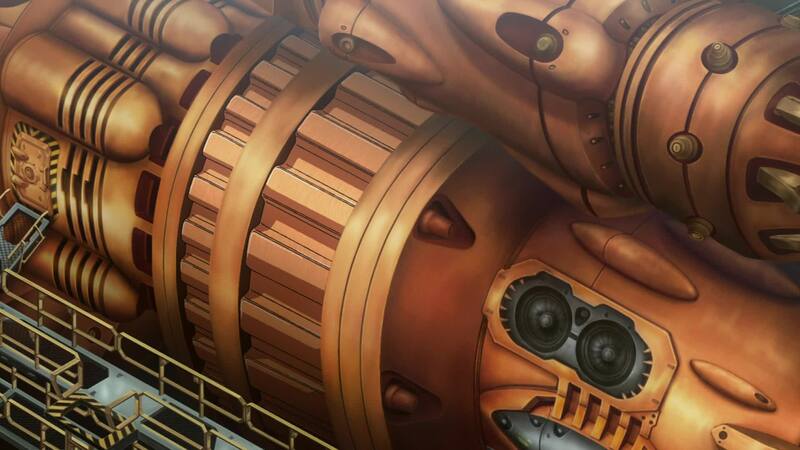 Instead, she sent her other sisters Sasha to deliver the Wave-Motion Core, a vital part of the Wave Engine. She ends by conveying her faith that mankind will overcome the unknown dangers of deep space and reach Iscandar. 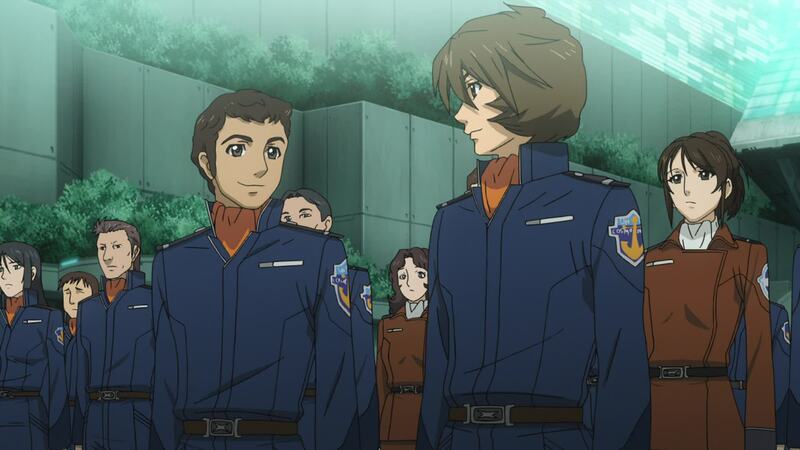 [LC]: This is our first view of officers Yoshikazu Aihara and Kenjiro Ota. If you pay close attention to these crowd scenes, after having watched the entire series (repeatedly), you’ll see a lot of familiar faces, though many will remain unnamed. Okita explains that since they received the technological assistance of Iscandar a year ago, a ship capable of interstellar flight has been constructed. Her name is…YAMATO. The crowd murmurs at the mention of the name. Okita tells them Iscandar is 168,000 light-years away in the Great Magellanic Galaxy, and that the long journey is unlike anything humanity has ever experienced. None of those present is forced to join the mission. Yamato will set sail at 0600 the following day. Those who choose to join must report by then. [DG]: It’s here that we find the director and writers have sought to produce a more realistic storyline. Yamato has been under construction for about a year, rather than the unknown construction time frame of the original. One thing to ask, however, is exactly how Starsha learned of Earth’s plight. Even assuming her status and her closeness to Dessler, it doesn’t seem like something he’d mention to her. [LC]: The distance to Iscandar has been increased from 148,000 to 168,000 light years in order to conform to the most recent astronomical data. As Okita leaves the stage, Shinohara comments to Kato that their fallen comrade, Yamamoto, would have loved this. Kato shushes Shinohara, knowing that Yamamoto’s sister Akira is just behind them. [DG]: Akira Yamamoto is the most marked change of the original characters…or is she? 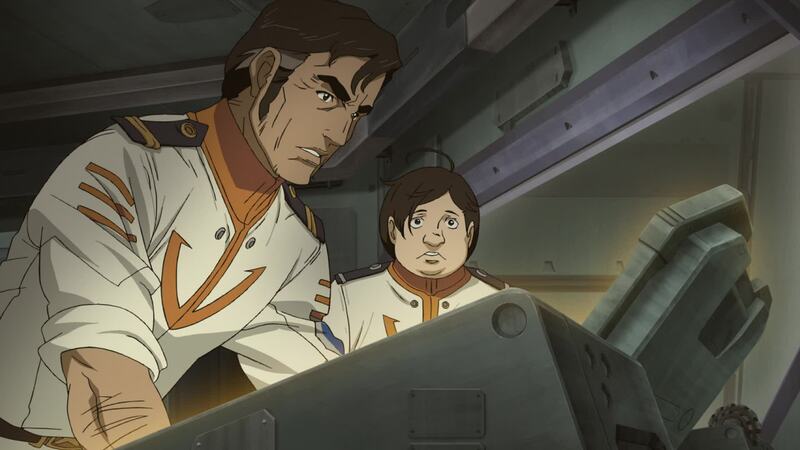 In the original series, Yamamoto (Hardy in Star Blazers) was Kato’s second-in-command in the Black Tigers. Here we learn that there was another Yamamoto who was evidently a member of Kato’s and Shinohara’s squadron. [LC]: Although many have expressed that view point, some facts about the character indicate she is the actual Yamamoto. First and most obvious, her name is the same as the original character, while her brother is named Akio. Also, Director Izubuchi has stated on the record that he decided to make Yamamoto female in accordance with the feeling of modern trends. Even before he knew about the live-action movie Yuki, Izubuchi had decided that Kodai should have a rival female pilot. Though that rivalry was dropped, it was decided to keep the character. 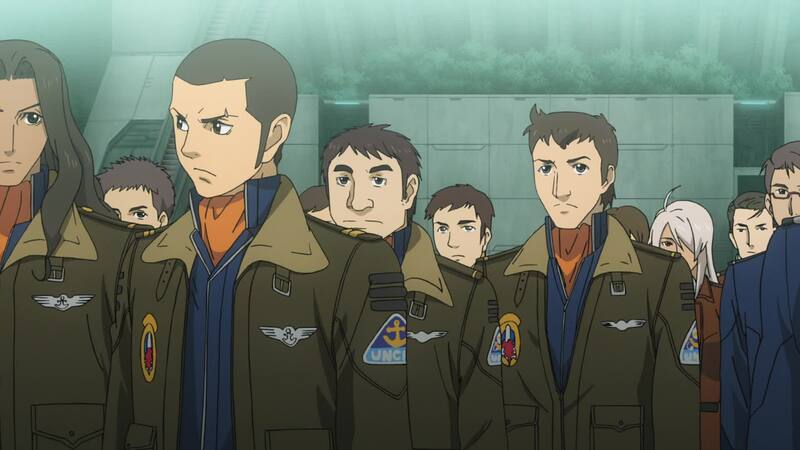 Since the original Yamamoto had been only a minor character (appearing only once in series 1 and a few times in series 2) the position of vice-captain of the fighter squadron went to Shinohara. 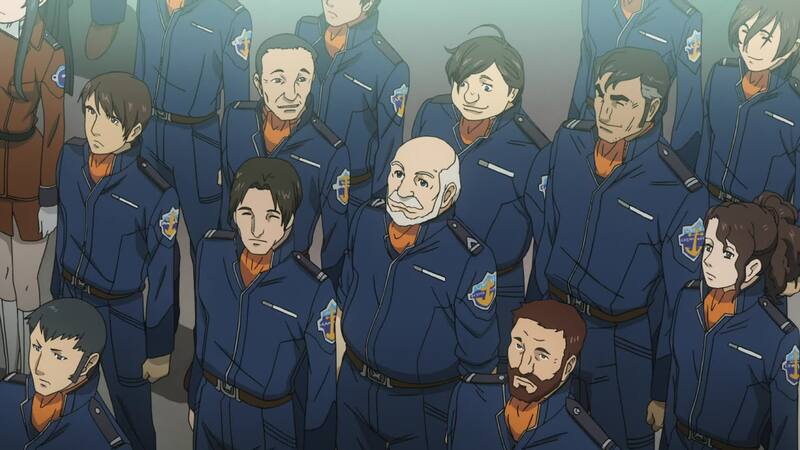 Still, gender-bending aside, the most important point is that Yamamoto went from a single scene where he crashes while wearing the wrong color uniform (an obvious production mistake, made worse in Star Blazers by naming him as Conroy), to becoming one of the most important and best-liked characters in 2199. Yuki, who’s been sitting at a desk on stage with Serizawa and Chief Todo, announces the names of those selected for section leaders. Tokugawa for the Engine Room, and Sanada for Engineering as well as XO (Executive Officer), come as no surprise. 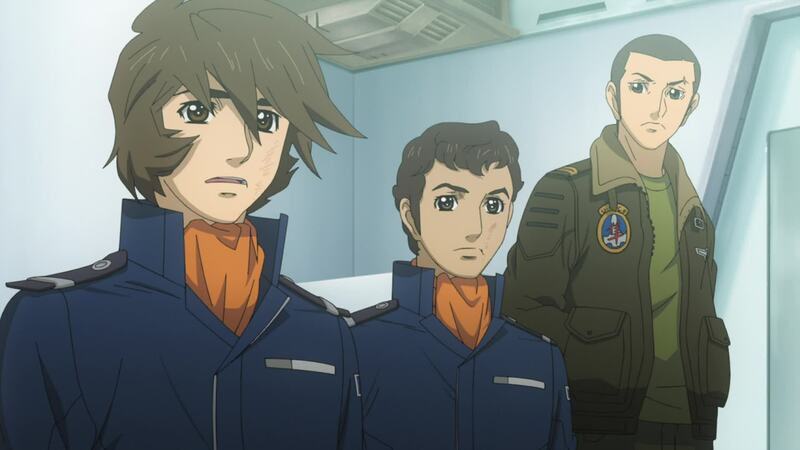 But Kodai is shocked to be assigned Tactical Officer, as is Nanbu, who will be serving under him. Shima is assigned to Navigation. 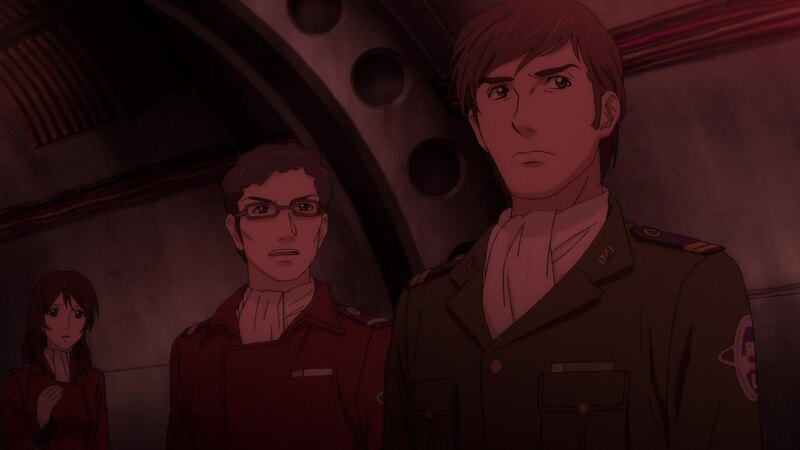 We see Yabu and Tokugawa in this sequence, along with another character ret-conned from the original saga, engineer Susumu Yamazaki, who took over from Tokugawa after Yamato 2. 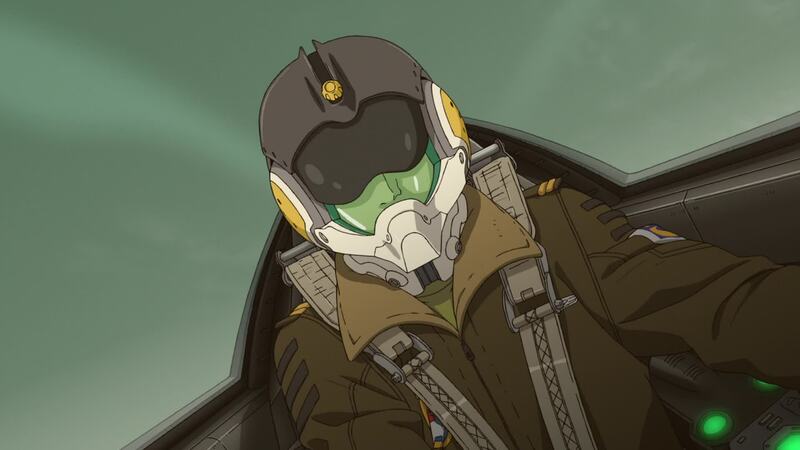 [DG]: It’s interesting here that while Kodai, Shima, Kato’s squadron, and Kaoru have common blue uniforms, Sanada’s uniform is army green. He’s referred to as a Major, which is not a Naval rank. 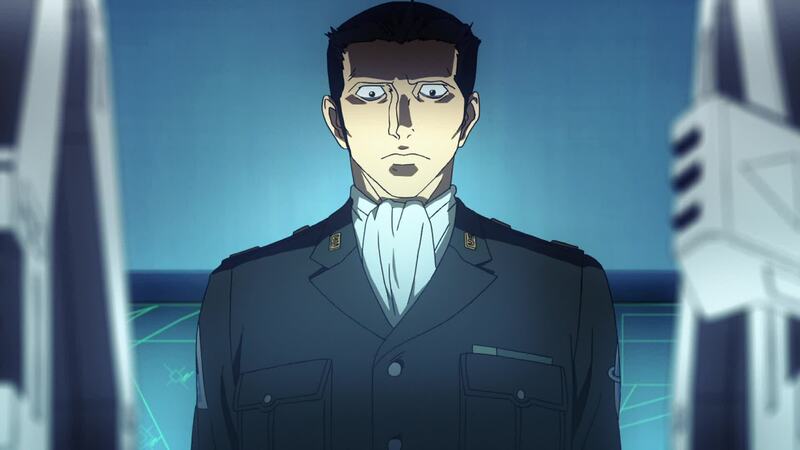 Is it possible that Sanada is directly under General Serizawa, and that Serizawa is chief of the Army? 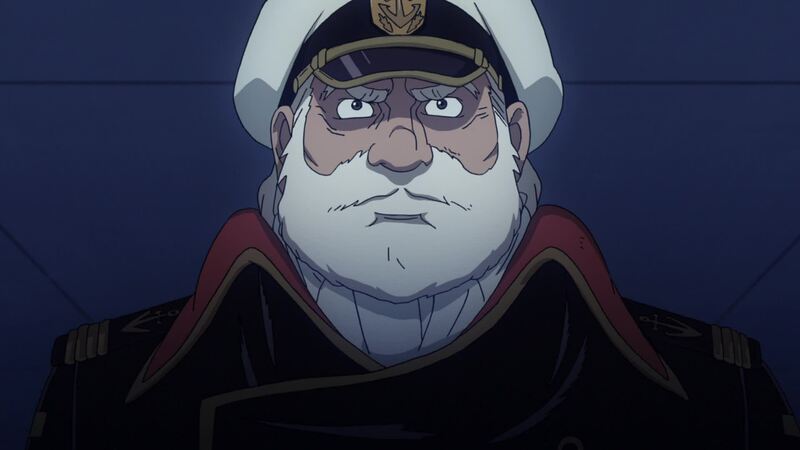 I can’t help but draw comparisons to the animosity that existed between the senior generals of the Japanese Army and Imperial Japanese Navy commander-in-chief, Admiral Isoroku Yamamoto, who flew his flag from Yamato during the Pearl Harbor attacks (while it was still uncommissioned) and again later when it was commissioned as fleet flagship the following February. Serizawa is clearly not happy throughout these two episodes that “his” Izumo Plan has been abandoned for the Yamato Plan. In his quarters, Okita is packing his bag and looking at his cherished family photograph. Hijikata tries to convince Okita to stay on Earth and allow him to command the Yamato mission. He says he’s not blind to his friend’s decaying health, and that it would be no shame to stay behind. But Okita is unmoved, bent on seeing the mission through, and says he’ll see the Earth again. Touched by his friend’s resolve, Hijikata promises to keep the Earth safe until he returns. [DG]: It is great to give Hijikata some backstory, especially his having a long friendship with Okita, which Dr. Sado mentioned to Kodai and Shima in Episode 1. [LC]: The young man in the photo is Okita’s son. As for the young woman, it’s unknown whether she’s Okita’s daughter or possibly his daughter-in-law. Not much is known about them except that Okita’s son was present at the Second Battle of Mars (Operation K2) and lost his life there. 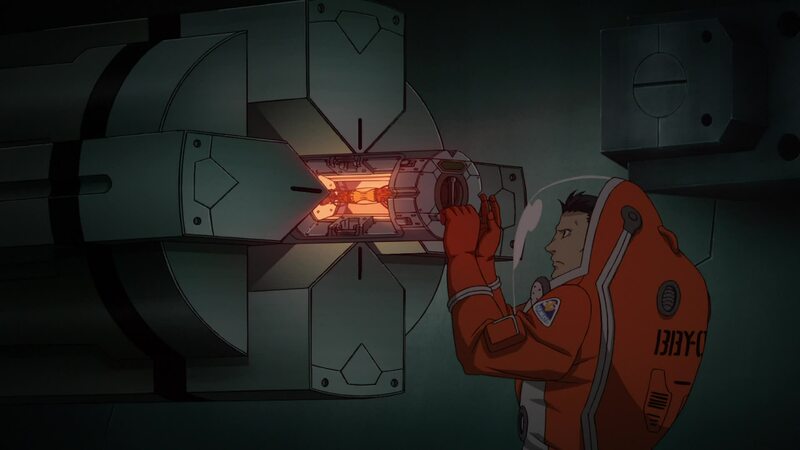 At the research lab, Sanada watches as the mysterious capsule we saw in the previous episode is stored inside a container. [DG]: This is the same capsule we see briefly during the previous episode. Once it was mentioned that another sister had come to Earth a year earlier, I assumed that it might have contained Yurisha’s body; that she’d lived at least long enough to provide the schematics for the Wave-Motion Engine and tell them of their enemy’s name. [LC]: The close-up on the capsule allows a dim indication of a humanoid shape inside, presumably Yurisha. It’s a question left unanswered, at least for now. The IPBM speeds past Jupiter. On Earth, Kato visits Yamamoto. 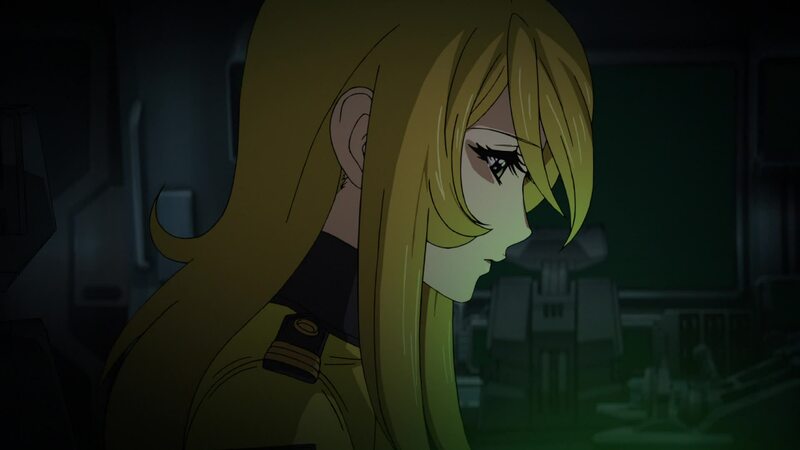 After paying his respects to her fallen brother and former squad member, Kato asks her if she intends to serve on Yamato. 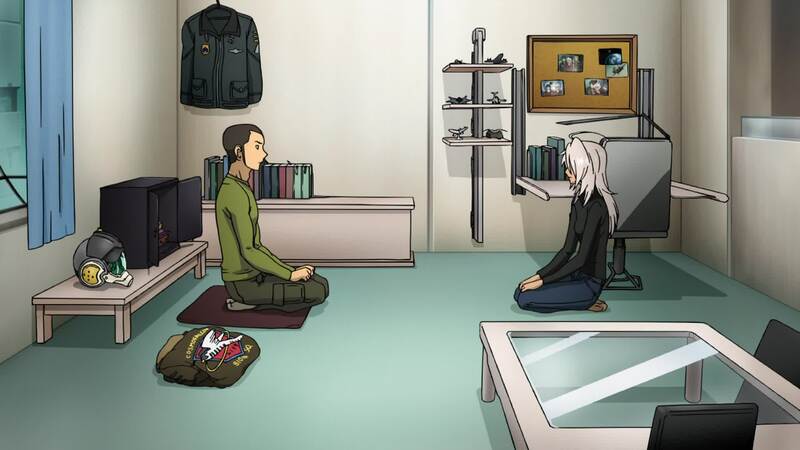 She says she requested a position in the fighter wing, but Kato had her reassigned to the Logistics Division. Yamamoto is visibly disturbed by this, but accepts his decision. 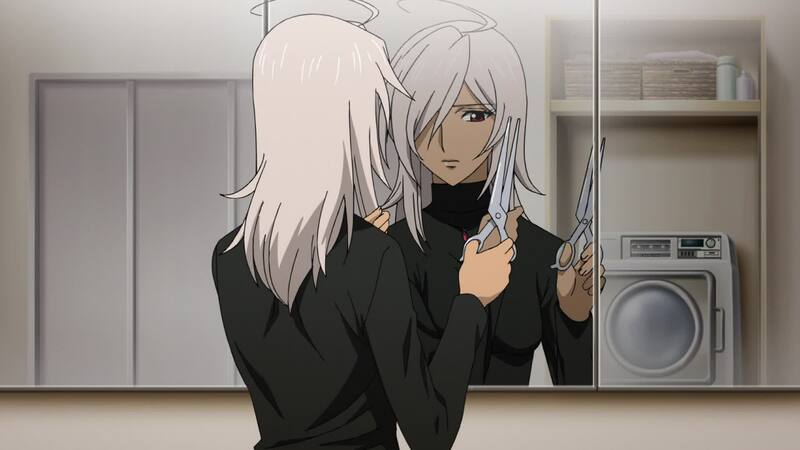 As she looks at her crimson pendant, she takes a pair of scissors and cuts her long, silver hair. [DG]: While the official subtitles say “Accounting,” it’s more the Logistics division, or as is more appropriate in a naval setting, the Quartermaster Division. I get the impression from this exchange that Kato pulled some strings to make sure Akira was not assigned to pilot duty. 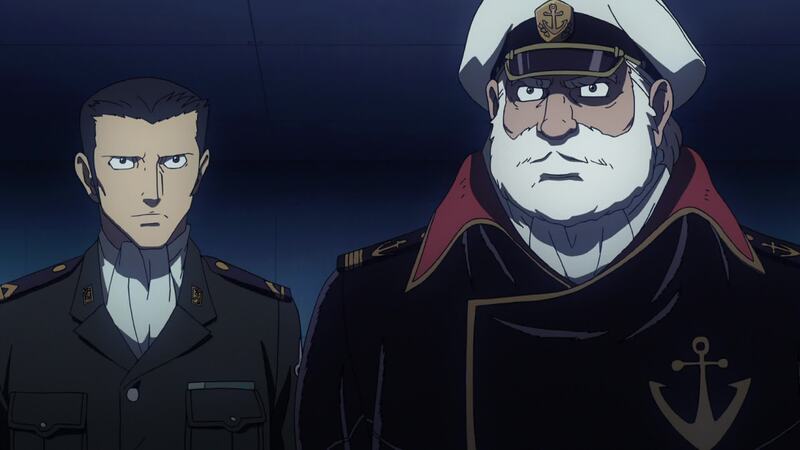 Meanwhile, am I the only one who thinks Akira’s brother does bear a fleeting resemblance to the original Yamamoto (at least from a hairstyle perspective)? The shelves are covered in model aircraft. 20th-century aircraft such as the YF-23, the SR-71, the Spitfire and the F-104 appear in the close-up shot. A tandem-rotor helicopter appears on a lower shelf in a wider shot. [LC]: Kato’s backstory continues to develop as we learn more about his religious past and relationship with Akira’s brother, Akio. One can’t help but assume that Kato feels responsible for the young man’s death, though we don’t know the circumstances that led to his fate. He is also quite protective of Akira, as if he has taken her brother’s place. 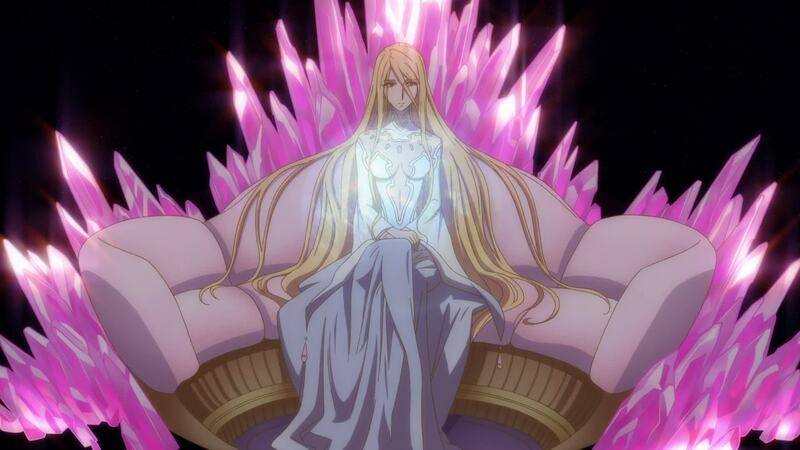 Akira and her brother are Marsnoids, the term used to describe those born on Mars. 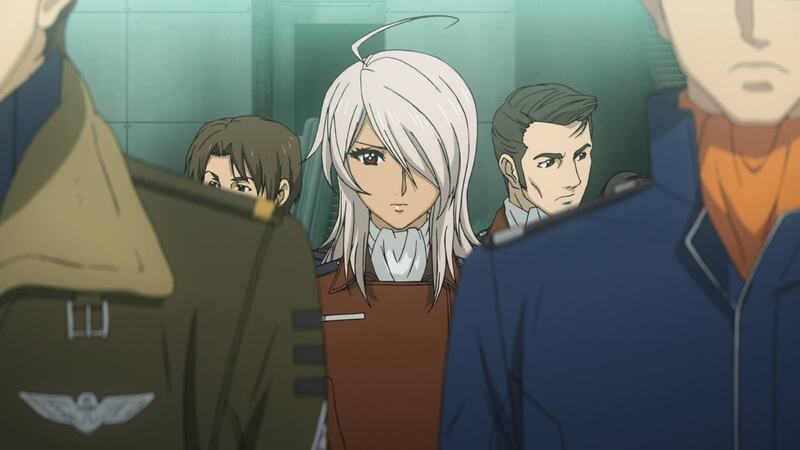 The physical traits of Marsnoids are quite visible in Akira, with her red eyes and silver hair. Her brother had darker hair but the same red eyes. The look the character takes after cutting her hair, along with the red eyes and a few more hints we’ll get in the following episodes, seem to point to an homage to anime director and Yamato fan Hideaki Anno, most famous for the Neon Genesis Evangelion saga. Those physical similarities between Eva‘s Rei Ayanami and Akira can’t be just a coincidence. Chief Tokugawa’s son and daughter-in-law try to convince him to relinquish his position, since he’s close to retiring. But Tokugawa says Okita needs him and that’s all he needs to know to venture forth. His younger son, Tasuke, comes in with his niece, Aiko. Tokugawa takes his granddaughter in his arms and promises to return soon. At the transport hub, Shima waits in line when his brother, Jiro, arrives. Their mother sent him to deliver a good luck charm that belonged to their father. Shima is touched by his mother’s concern and asks Jiro to take good care of her, all under the gaze of a very attentive Niimi. 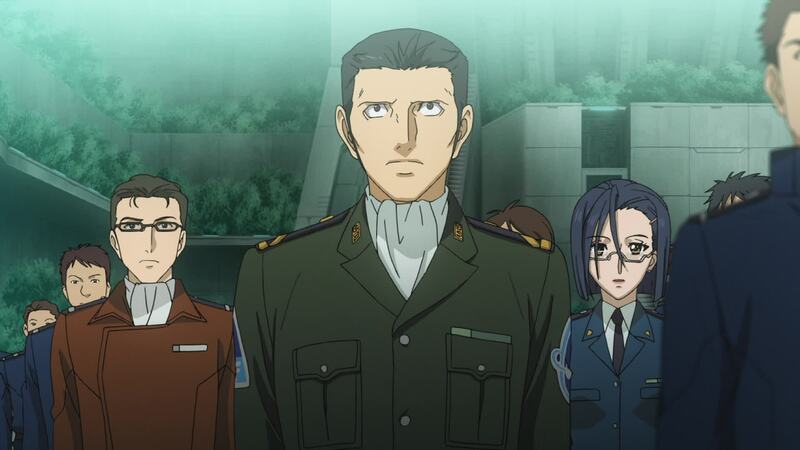 [LC]: Shima’s father, Daigo, was captain of the UNCF Cruiser Murasame. This particular story will play an important part in future events. 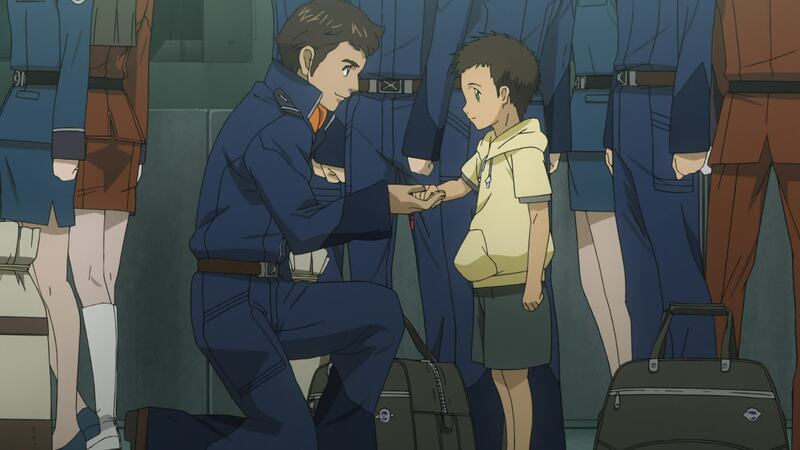 In this scene we learn that he has already died, coincidentally in the one time he left for space without the good luck charm Jiro gives to Daisuke. This prompted their mother, Saori, to send Jiro to make sure his brother gets it before he leaves. 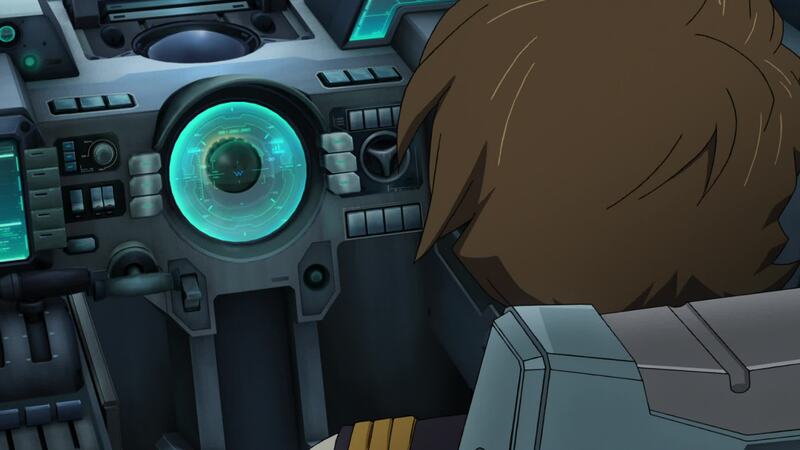 Thus, as Kodai’s watching this broadcast, it’s 13 hours 28 minutes until the launch. In other words, it’s 16:32 the day before the launch. Of course, the 16:30 on the ticker means news is coming fast. These riots seem to break out at the same time every day! [LC]: Another funny detail is the station’s logo, FEB. This stands for “Far East Broadcast” but can also be seen as an hint to the fact that we’re in February, by this time. We see several transports rushing through a vast tunnel. 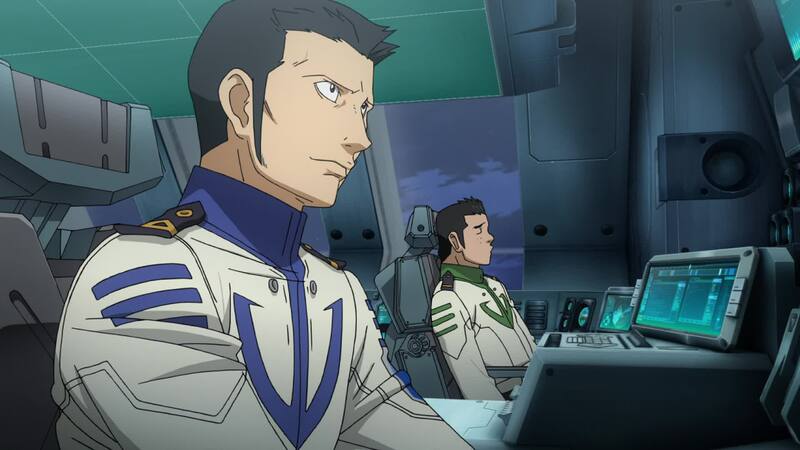 Doctor Sado seems sad, prompting nurse Harada to tell him the “Omshis” aboard the Yamato can make sake. But Sado is sad for having to leave his cat behind. Across the aisle, Kodai sits by the window. As the transports leave the tunnel, he gasps in wonder. A huge cavern opens up before them, and the road leads up to a brightly lit section, looking like some sort of construction site. Above the site, as if born from the bedrock above, the immense hull of a ship. [LC]: The transport carries not only Kodai, Sado and Makoto, but also Tokugawa, Yabu, Hoshina, as well as a few new faces we’ll get to know pretty well. Among them are security chief Shinya Ito and Yuria Misaki. I also have to make a special mention of Toyama and Iwata. 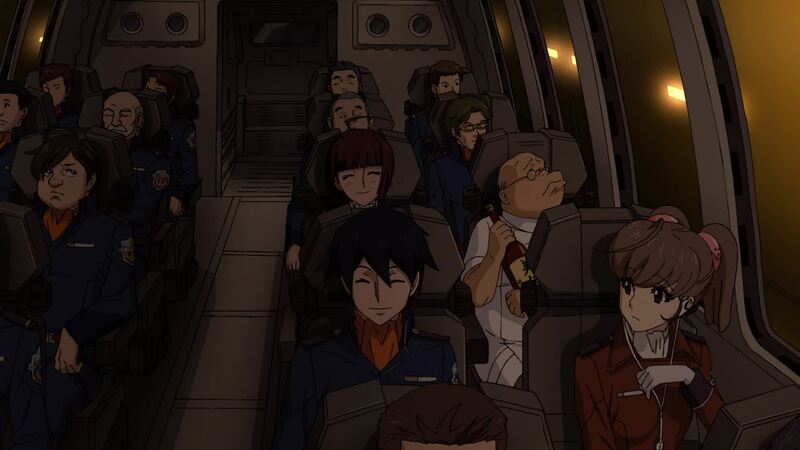 Though at this point they’re still anonymous faces on a bus, they’ll have quite a ride on Yamato. 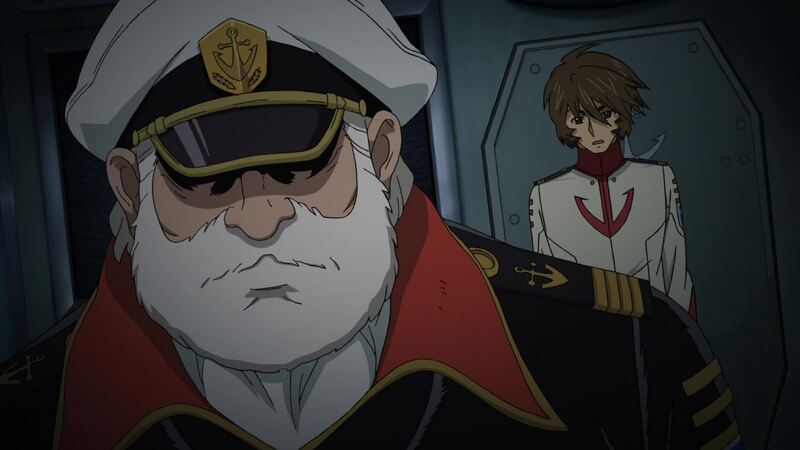 Also, it’s funny to point out that, being part of Boatswain Enomoto’s staff, they actually appear before their chief does. 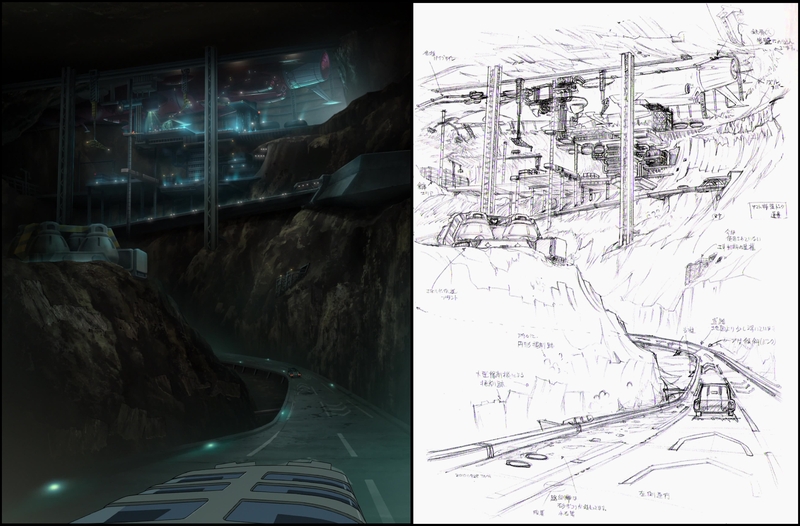 Also, it’s worth noting, unlike the original show, the transportation technology in 2199‘s cities is a bit more down to Earth. 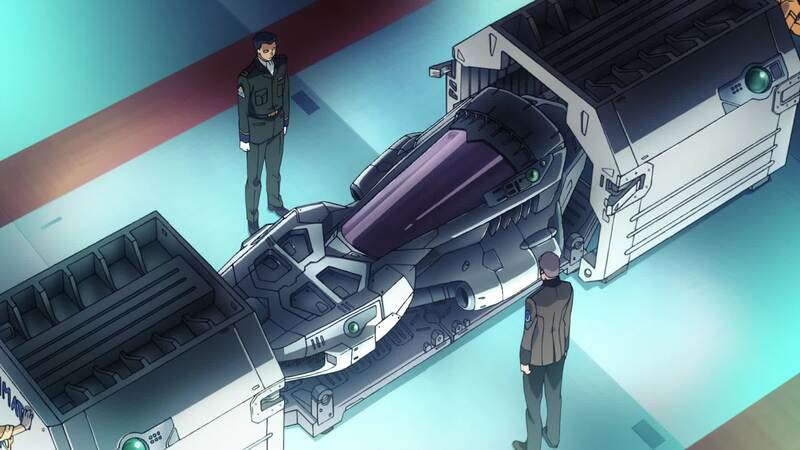 While the original sported flying cars of several sorts, here we get actual wheeled vehicles and even, as we saw in the previous episode, an actual train system to carry people around. 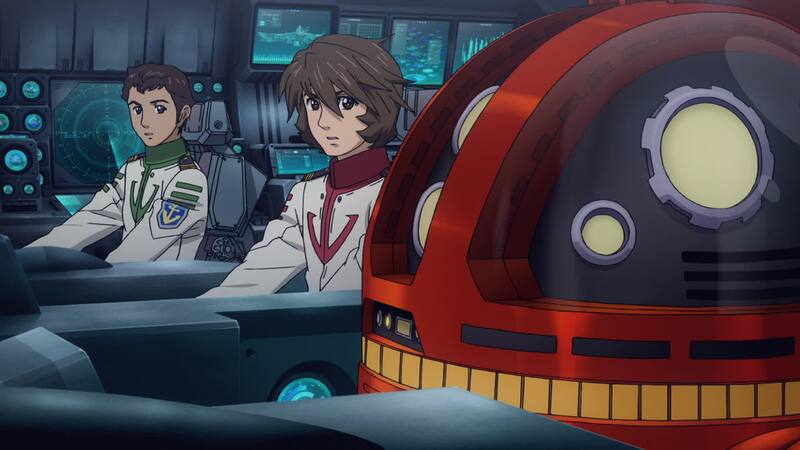 “Omshis” is a pet name of sorts for Yamato‘s Organic Materials Cycling System, or O.M.C.S., which is, lets face it, 2199‘s slightly twisted version of Star Trek‘s food replicator. More on this in Episode 4. [LC]: We now arrive at one of those scenes that will make non-fans laugh. The scenes where we establish the UNCN has constructed mankind’s last hope in the most improbable way and place imaginable. The logistics of such construction are described here in great detail, so i’ll leave you to it. For those still laughing. there is no other way to discuss this than to wax philosophically for a moment. Jump ahead if that’s not your thing. The iconic image that closed Episode 1 is one of these moments, which can be ret-conned as we explained in our commentary. But now we have a greater issue. 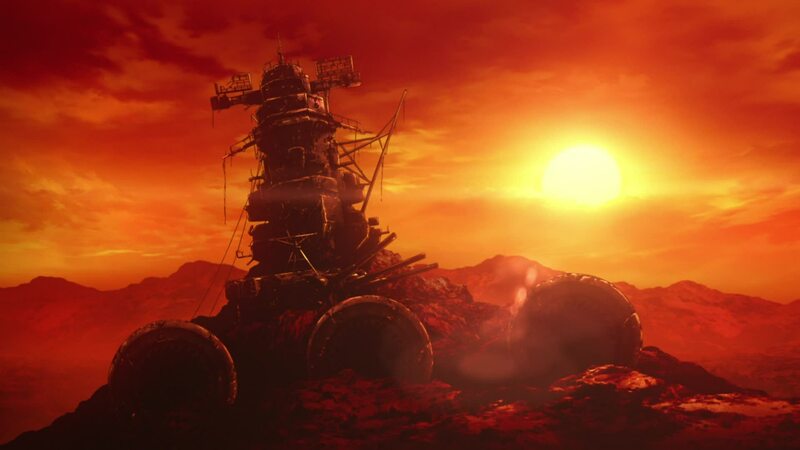 By saying that the ship in the sunset is not the actual WWII Yamato, logic is preserved as we know that the wreckage of the ship would not allow such imagery. Also, you couldn’t construct a space-faring ship from the wreckage of a centuries-old sunken battleship. Izubuchi was confronted with a choice. Change the setting to something more logical? Building the ship on an underground shipyard, away from the hazardous Earth atmosphere and the prying eyes of the Garmillas? Yes. That would be the most logic way to do it. But would it still be Yamato? As long time fans, each of us has run such scenarios in our minds. We’ve picked at every detail and most have come up with more grounded and logical ways of doing things. 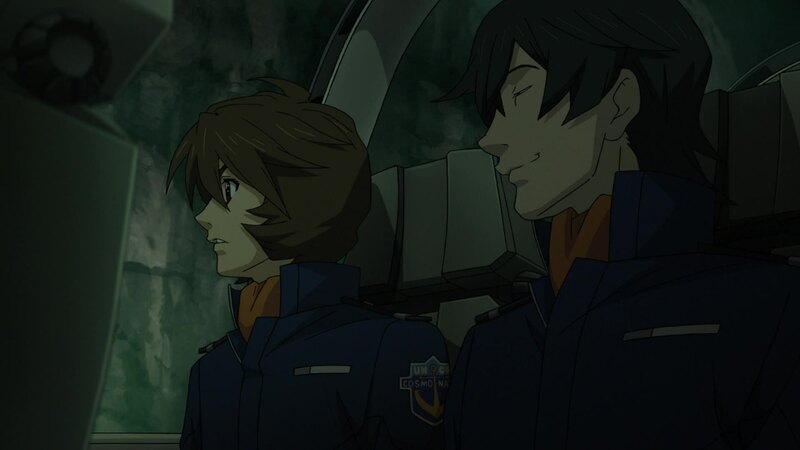 We look at our elaborate plots and ingenious machinations…and toss them aside to sit in front of our screens, looking at a space battleship, being illogically built in the most hazardous way possible. Why? Because for its many logical flaws, Yamato has that Yamato Flavor, something special that makes it a timeless classic despite its ridiculous premise. And because of that, in the end, Izubuchi’s choice is but an illusion. Had he chosen pure logic, he would have made something only Yamato-like. As a fan at heart like us, he knew there was no other way to do things. [DG]: Yamato has always required a decent amount of suspension of disbelief, but 2199 requires less than the original, as they’ve put more thought into scenes like this and shown some inkling of how it would be done in the real world. The inexplicable things that were just there, labeled as science fiction forty years ago, turned into further detail here. We see it with engineering, starships, fighters (notably how they change vectors being more realistic), planets, and distance – revising the distance between Earth and Iscandar due to better knowledge. 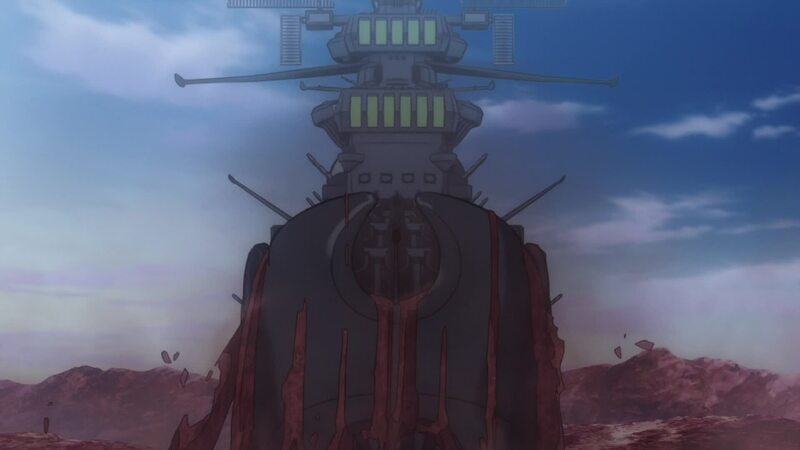 [DG]: We get a good look at the ventral side of Yamato’s stern. The engine exhausts for the Wave-Motion Engine and the Auxiliary Engines are all sealed up, and it looks like the hangar bay is being used to load cargo. Pan around to a view just behind the hangar bay ramp, and we see the side hangar bays open with hoses connected to the inside. [LC]: Yamato‘s hull seems to be modular in nature, though this is not often featured. Entire segments of the outer plating can be moved aside to allow access to the inner sections of the ship. 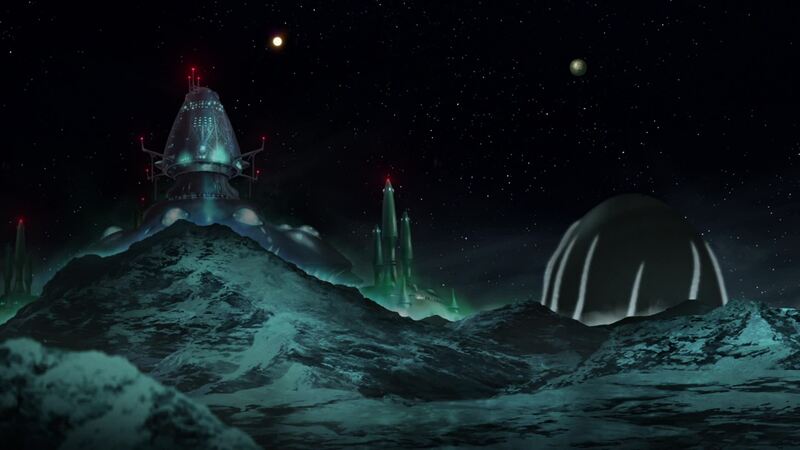 Actually, the best view of this comes in Episode 24, where the medical bay can be viewed. From design sketches, one can surmise that, rather than going through lengthy remodeling work for repair of upgrade, modules can simply be removed from the and replaced. Again, this feature was not shown and is pure conjecture on my part, but the principle seems practical enough. In this particular scene, the blisters in the hangar section seem to be open, maybe to load the Falcons onto their pallets. The site underneath the juggernaut is bustling with activity, as the loading operations are still taking place. Next to some flatbeds, carrying Cosmo Falcons to be loaded into the ship’s hangar, Boatswain Isamu Enomoto is directing the “mysterious capsule” container to the Automatic Pilot Room. He is momentarily distracted by the arrival of a transport and grins when he sees Kodai exit. Kodai looks around in wonder as he approaches the ramp leading up to the ship. [LC]: Here’s another one of those dumb pieces of trivia I like. 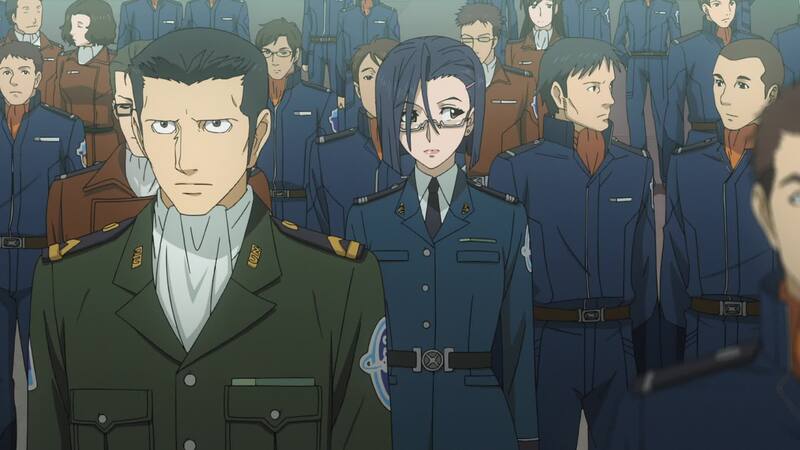 In this scene, Chief Enomoto becomes the very first character to be seen wearing a Yamato-issued uniform, even if deckhand section’s uniforms are slightly different from the standard. But he’s first, just the same. As for the standard uniform, Yuki is the first seen in women’s uniform and Kodai in men’s uniform. 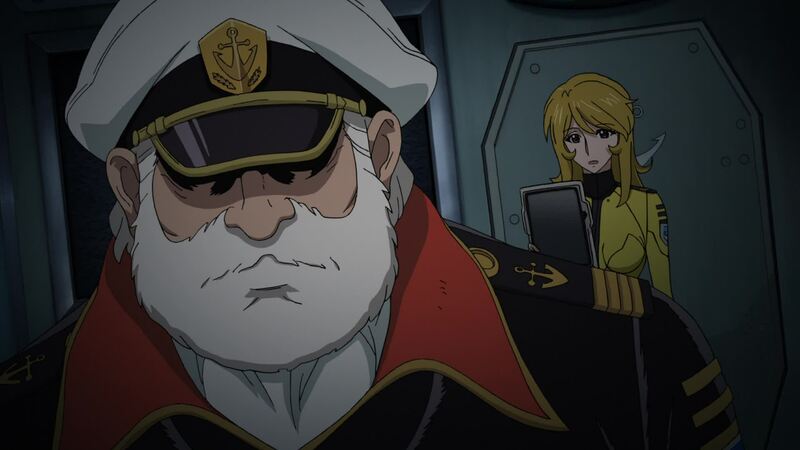 In the Captain’s Quarters, Yuki reports that all the chosen officers have reported for duty. Okita says all that is left now is getting the engine to work. In the engine room, Tokugawa and his staff are standing around Sanada, who holds the Wave-Motion Core, now installed within an adaptor plug. 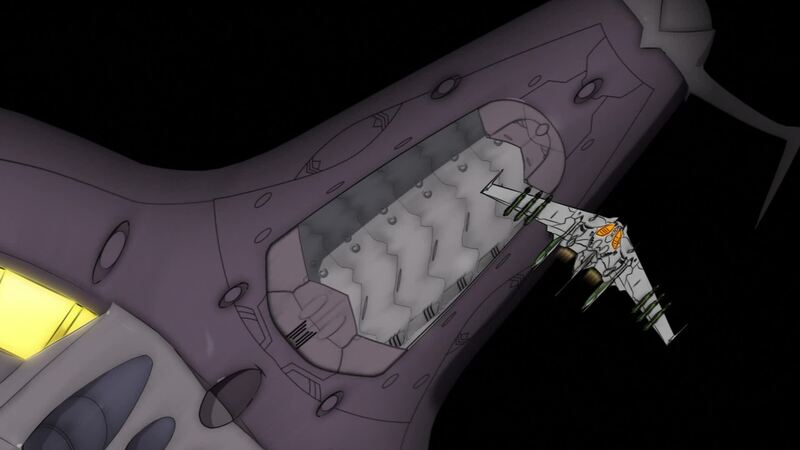 Sanada goes into the engine core room and inserts the plug, initializing the system. But now they need a large amount of energy to start the engine, which leads the always-cheerful Yabu to complain about how their goddess hasn’t made the process easier. [DG]: My personal view is that the Wave-Motion Core is nothing more than a control computer for the engine, with the software needed to keep the engine stable and running. There’s nothing to suggest that it contains any catalyst material, as it still requires a huge amount of electricity to start. As the series goes on, my support for this view will become more apparent. [LC]: I can’t help but wonder why Sanada is wearing this suit. The rest of the engine room staff are there with him so it’s not an environment issue or any energy given off by the core. The chamber he goes into could have something to do with it, but we see people enter it in future episodes, and they don’t require any special clothing. Perhaps they feared the emission of some harmful radiation as the core is plugged in. 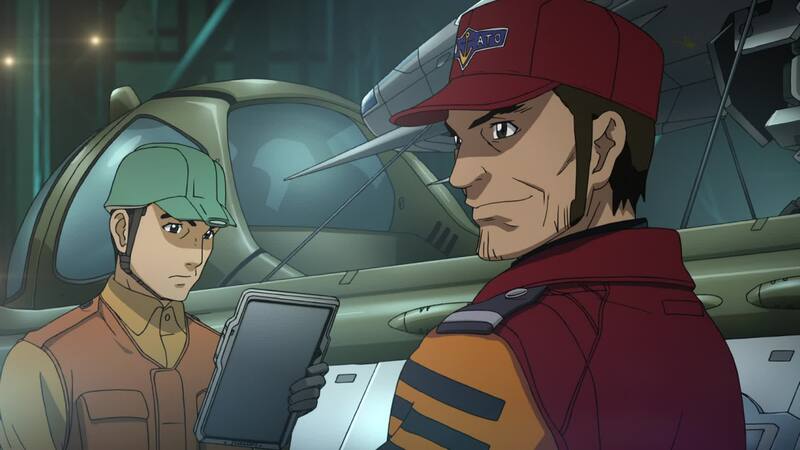 The manga version does have Sanada and another crew member carrying the core into the engine room, both in these suits, while everyone else is kept out. Perhaps an eventual English translation will shed some more light on this subject. 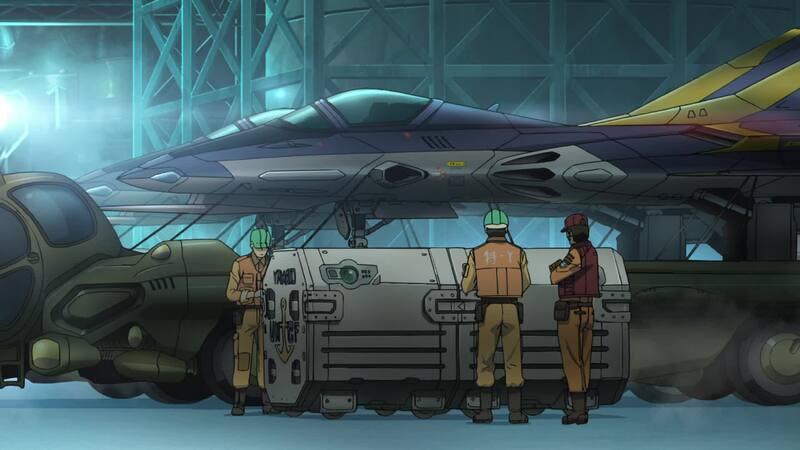 In the Zero’s hangar, Yamamoto looks at the two gorgeous fighters in their folded mode. She hides when Kodai and Kato enter. 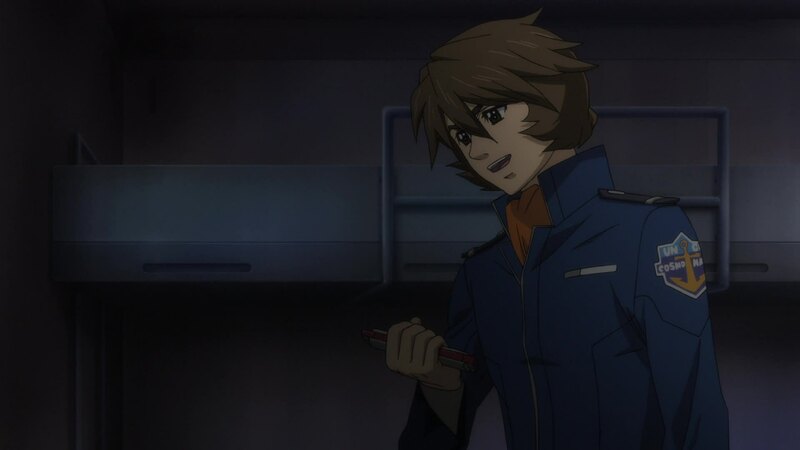 Kato salutes Kodai as his superior and vows to follow his orders, but proceeds to warn him that if he gets any of his men killed needlessly, there will be trouble. Kodai simply tells him that won’t be an issue. 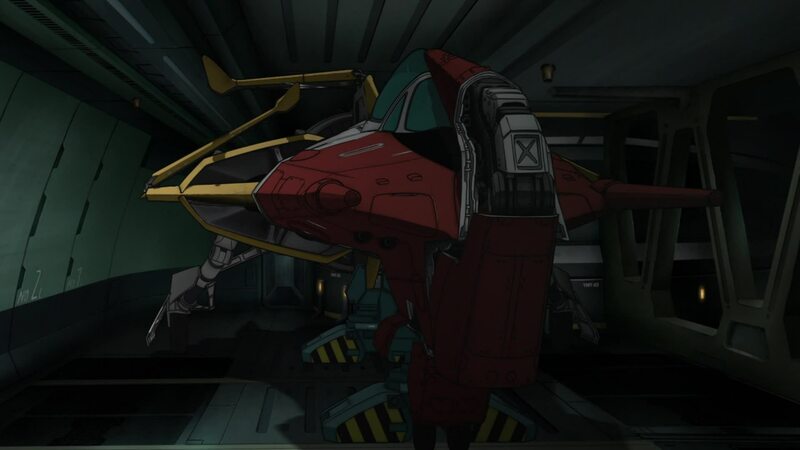 [LC]: This is the first time we see an actual Type 52 Cosmo Zero (remember, the one in the previous episode was actually a Type 51) and the first time the iconic fighter is shown in this “folded” mode. Even stored, this is one beautiful craft, a gorgeous piece of design. In the darkened main bridge, Yuki is at her station, bathed in a pale green light, and promises to return home. Startled by Kodai’s arrival, she quickly closes and hides the golden oval object she was holding. [DG]: This is where months and months of speculation began. Exactly where was Yuki returning home to? It was starting to look like this time around, Yuki actually is Starsha’s sister (albeit Yurisha rather than Sasha), a notion that only came up in passing in the original. 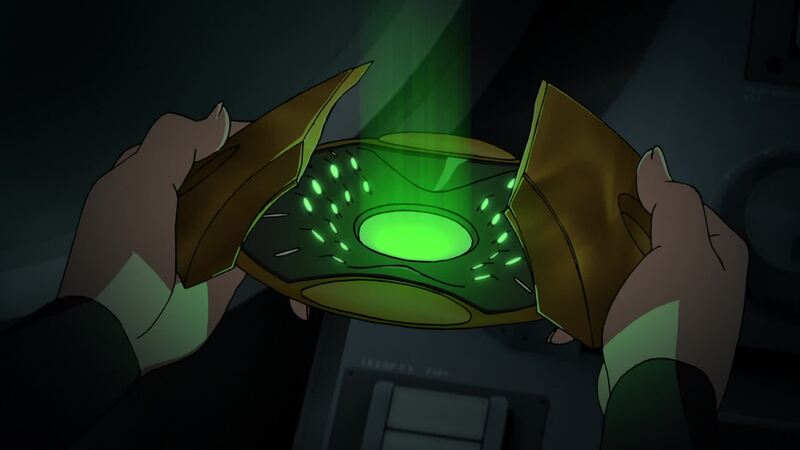 The device looks to be some kind of holographic projector with a green three-dimensional field emitting from it. [LC]: That little capsule is one of the few things that I actually found quite frustrating by the time the series was over. Don’t worry, i’ll let you know why as this guide progresses. Kodai is surprised to see her there. 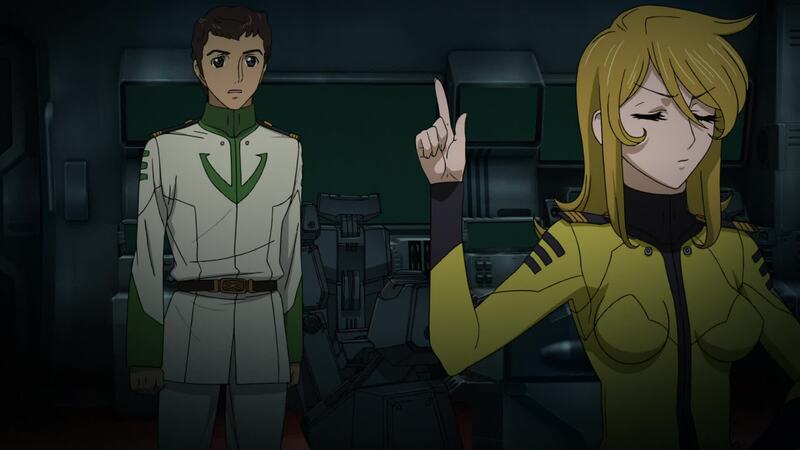 Yuki tries to make a fresh start by introducing herself in a more friendly tone than when they first met, but Kodai dismisses her, asking where he can find the captain. Okita, still in his quarters, tells Kodai to come in. Kodai is unsure about his assignment as Tactical Officer. 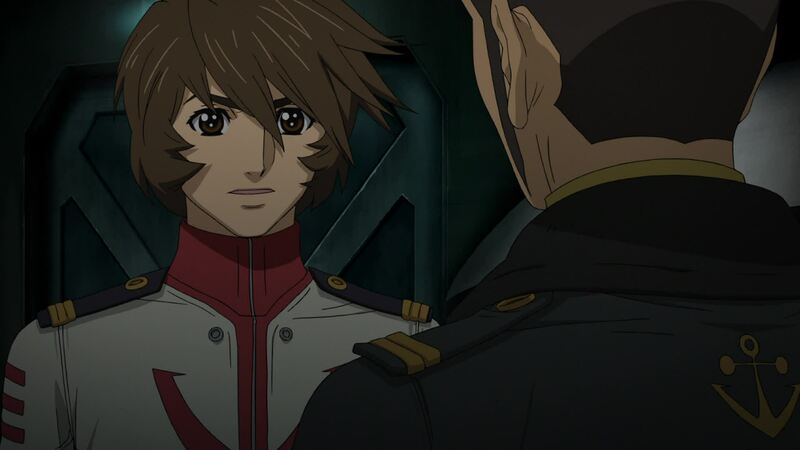 Unlike what he did with the UN representatives, Okita is bluntly honest with Kodai, telling him all those who were meant for command positions were killed in the previous attack. 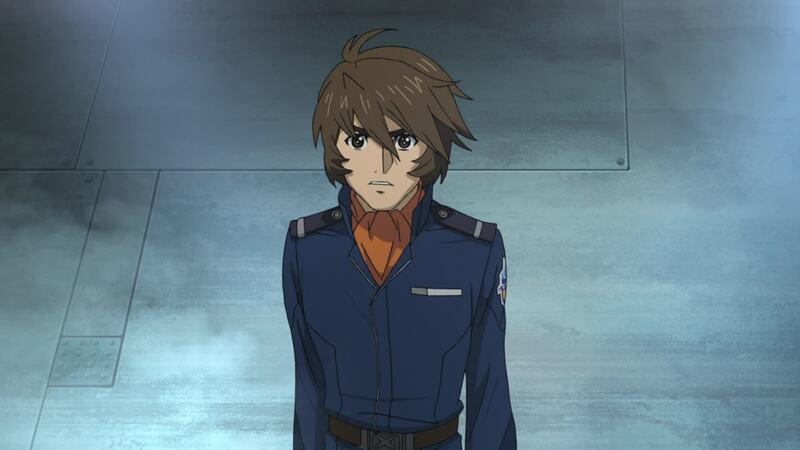 The tactical station was meant for a person whose death he’s also responsible for: Kodai’s brother Mamoru. Kodai is stunned by this revelation. Okita says he gave him the post based on his service record and his belief that Kodai is the man for the job, but that he is free to decide to accept it or not. [DG]:Two important points here: (1) while the official English Subtitles say that “all the candidates for section leader died in yesterday’s bombing,” this is a limiting interpretation. Okita’s sentence begins with “先日” (senjitsu ni, or literally “the other day”) so it’s not as limiting. (2) We don’t know for certain that Mamoru was intended to be Tactics Division head, although it is reasonable to assume. It could have been another case of Okita telling someone exactly what they needed to hear, like with the UN delegates. Yuki is venting about Kodai’s rudeness when Shima comes in and introduces himself. In a funny role-reversal, she dismisses him and tells him the captain is in his quarters. Before Shima can figure out what’s going on, Kodai returns. 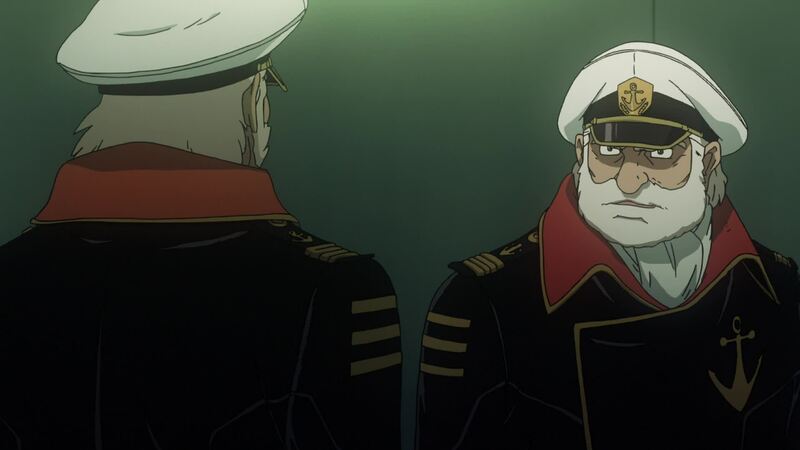 He’s visibly perturbed by what the captain told him, but says everything is all right. 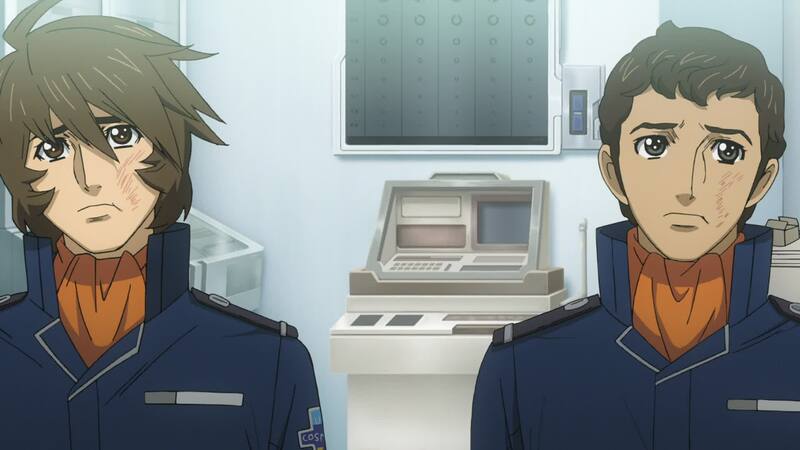 The rest of the command staff arrive and Sanada introduces himself as the ship’s XO. Suddenly, an alarm sounds and Analyzer comes to life at his console. Sanada tells the others to man their stations. 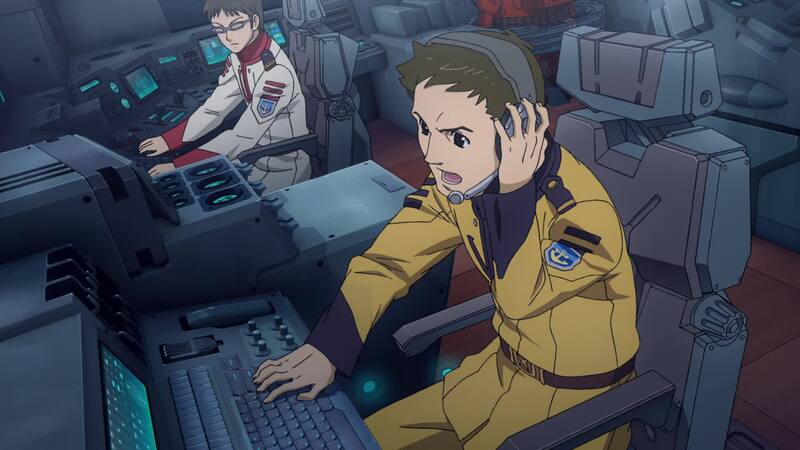 At the communication console, Aihara receives a report concerning the approaching IPBM. 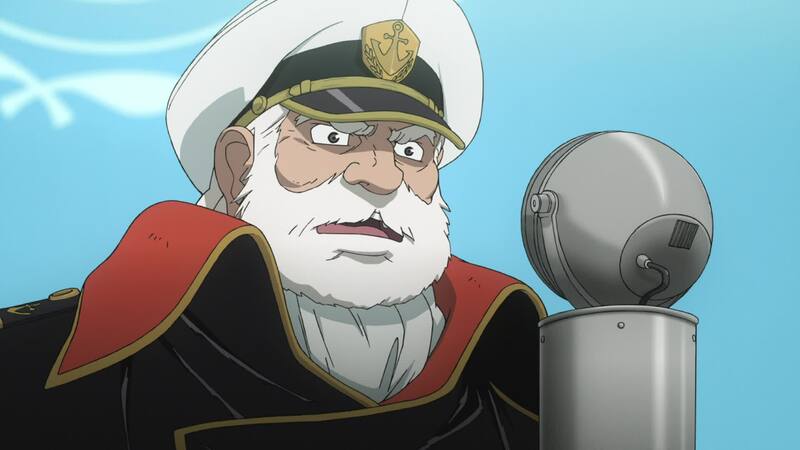 He announces the missile’s target has been confirmed as Yamato. [LC]: Two curious notes. 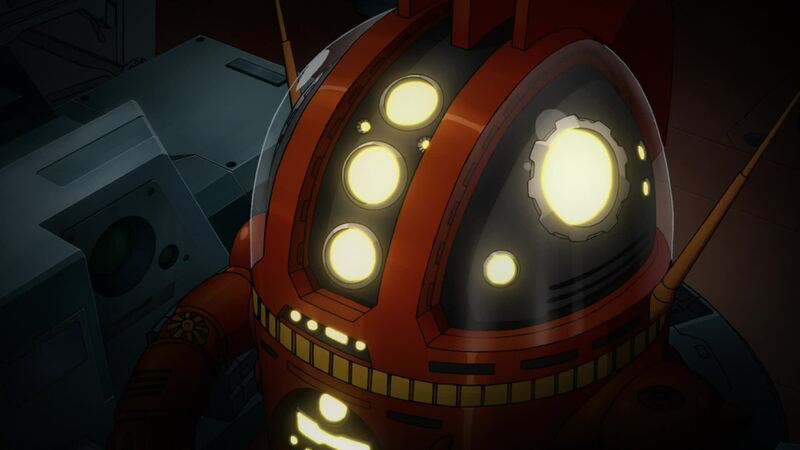 Although this is the first time we actually see AU-09, aka Analyzer, he almost appeared in Episode 1. 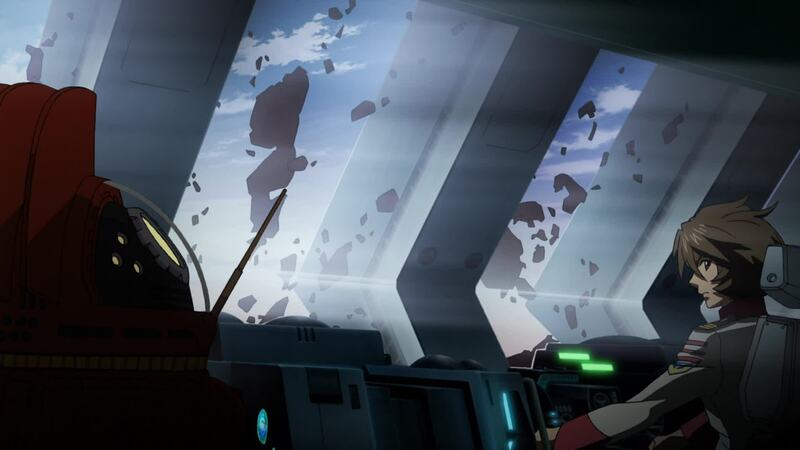 Remember the scene in which Hijikata looks over a piece of Garmillan ship debris inside a dome, in the HQ’s lab? Well, Analyzer, or at least the same model robot, is attached to that dome via a similar console he now has on the main bridge. Also, in the original, the console that now belongs to Analyzer seemed devoid of purpose besides providing a chair for any visiting characters in select scenes. It was later designated as an “analysis station,” and Analyzer only occasionally used it. Now it includes a docking port for the ship’s autonomous computer unit. Eagle-eyed fans will also notice another seat re-arrangement. Sanada and Ota have switched seats. In the original saga, Sanada occupied the forward port console next to Shima, while Ota sat further back. The new placement makes more sense, given Ota’s role as Shima’s aid. Shima wonders if they can launch in time. Analyzer states that they don’t have enough power to start the main engine, making Ota freak out. 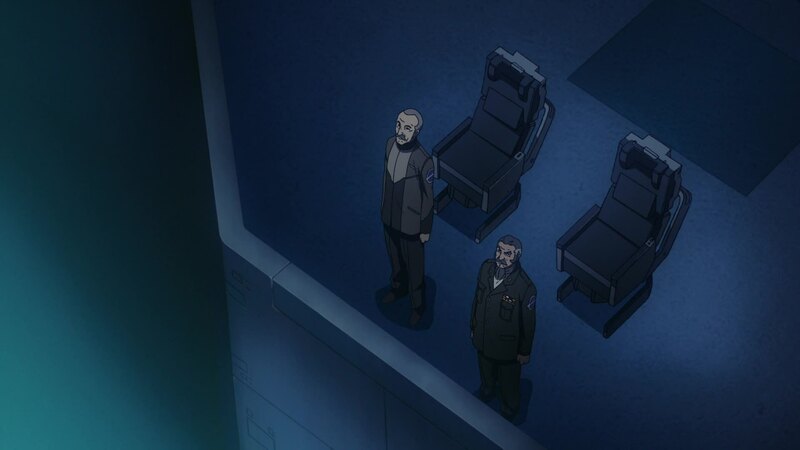 Okita’s voice echoes through the bridge as his chair descends from his cabin into the command station. [LC]: Around this point in the manga version, given that they’re unsure if Yamato can be launched, the Kirishima has been deployed to intercept the missile. Though they do score a few direct hits, the missile is pretty much undamaged. It suffers only a slight deviation from its course, which is quickly rectified by its automatic targeting systems. More on the IPBM’s characteristics further down. You can see the pages in question here. Power levels begin to rise. The other sectors around the world have diverted whatever power they can spare. Yamazaki confirms that the engine is powered and ready to start. Okita gives the word and Tokugawa monitors the engine’s performance as the massive flywheel turns for the first time. Shima preps all systems for liftoff as the IPBM speeds toward Earth. 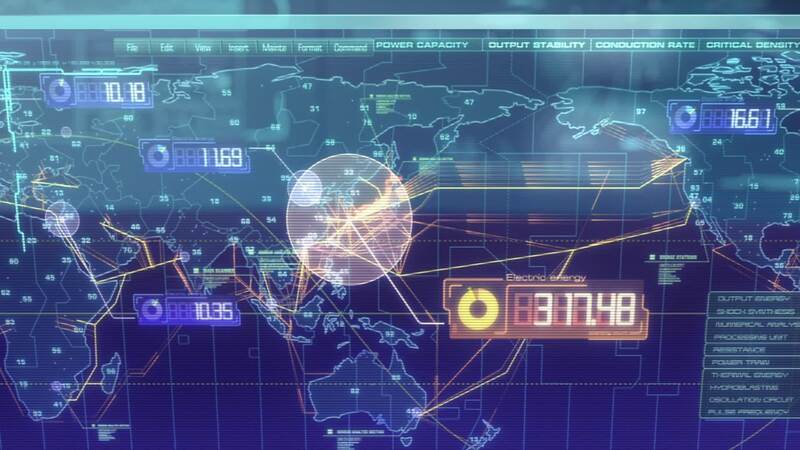 [DG]: The world map shows the existence of a worldwide super grid for distributing electricity. Fixed core/engines: maintaining them in a stable position is a logical thing to do with such a weapon. If you need to order any course adjustments, either by pre-programmed data or remote control, you don’t need to equate the spin of your constantly-moving thrusters. Having them fixed makes the task much easier. Spining Outer Body: ballistic projectiles are given a spin for stability. But this is a gigantic missile flying mostly through space. I doubt the purpose is to be accurate upon entering a target planet’s atmosphere, as I’m guessing pin-point accuracy is not really relevant with such a huge weapon. Let’s face it, if it hits a mile away, you’re still dead. 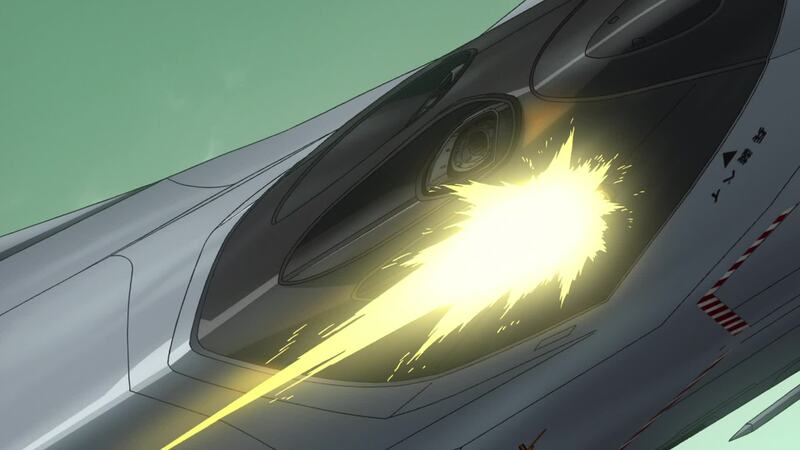 From that manga scene I described earlier, we see Kirishima‘s positron canons actually hit the missile, but their impact is somewhat deflected by the spin of the body. This shows us two things; first, the IPBM’s don’t have the same Migobueza Coating as the Garmillan ships. Makes sense, since devoting a valuable resource like that for single-use would be a pointless waste. Secondly, although it has no protective coating, it resists the positron beams. We don’t know how thick the missile’s plating is, or even if it’s plating at all, rather than a massive, solid block. But in any possible circumstance, the spin is probably responsible for beam deflection. The missile seems to spin relatively fast. Considering its sheer size (remember, were talking about a 950m diameter), that surface is moving quite fast. That means the beams don’t make prolonged contact with a single point of the missile long enough to do any damage. Think of it as holding your hand over a lit candle. If you keep it static over the flame, you can’t stand it for long. But if you keep moving your hand, the energy disperses and you avoid damage. 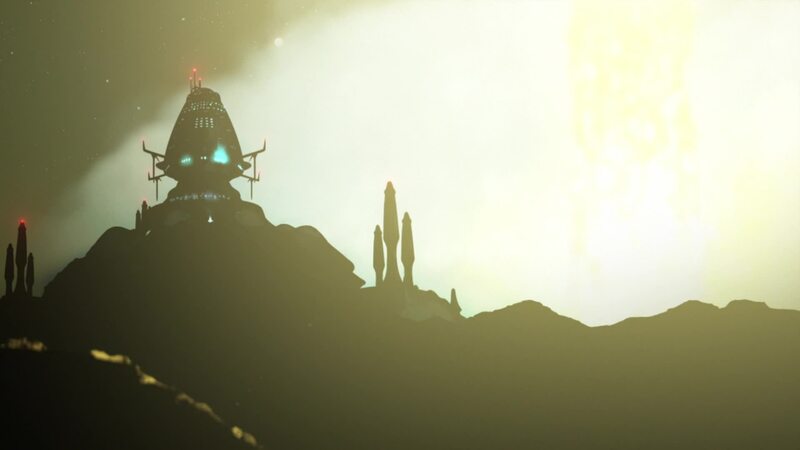 The sun rises as they make visual contact with the missile. Okita orders launch operations to commence. On the surface, the ground around the ship shakes and breaks up. Rusted metal falls away to reveal a shiny new surface. Kodai realizes the ship they had seen being attacked was actually the Yamato, camouflaged to deceive the enemy, which Okita confirms. [DG]: The sunrise time around southern Kyushu in February is around 6am (Google for February sunrise times in Kagoshima and you should find this info). As such, departure time is in accordance with Okita’s address to the candidate crew the previous day. 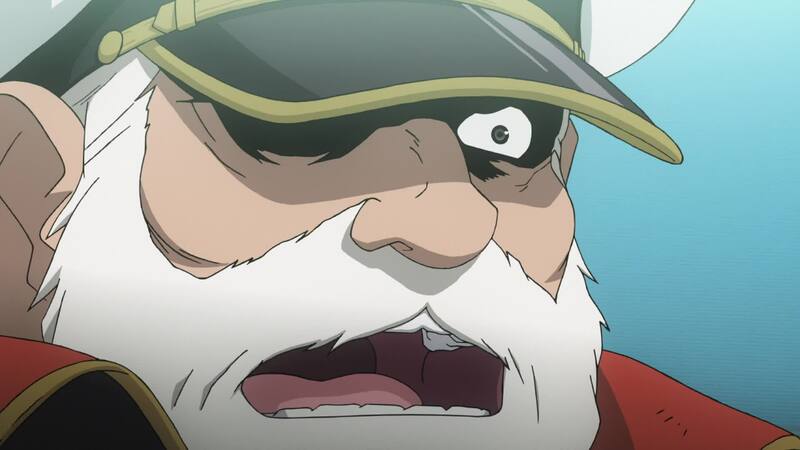 Also, interesting that Okita confirms Kodai’s realization by referring to it as the Space Battleship Yamato. Okita orders Kodai to prepare to fire the main cannons at the missile, with gunnery crews taking their positions. Finally, the order is given to Shima to launch the ship. 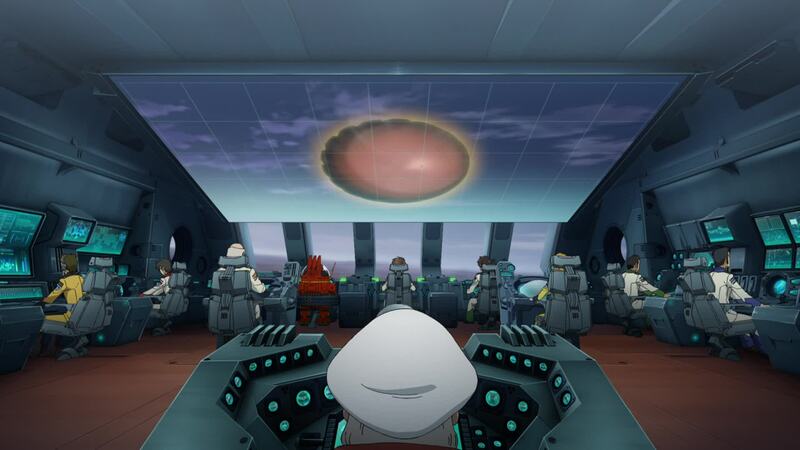 Upon his command, carefully place charges detonate, releasing the Yamato which quickly takes to the skies. [DG]: Now we have the question of the date of the launch. CosmoDNA Facebook group member Lloyd Corricelli pointed out at one point that February 12 is a significant date for the IJN Yamato. It was the date in 1942 that it was appointed flagship of Isoroku Yamamoto’s Combined Fleet. 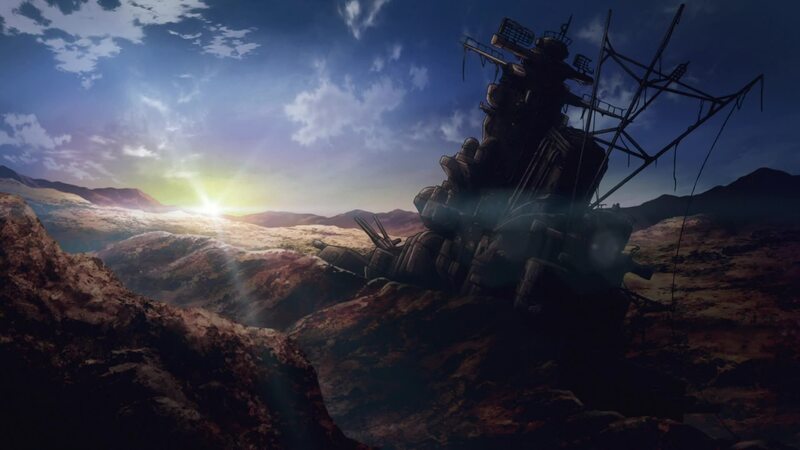 Also, the production committee likes significant historic dates both in the series itself and for its cinematic and TV premieres: both Chapter 1’s 2012 cinema premiere and 2013’s TV premiere fell on April 7, the anniversary of Yamato‘s sinking in Operation Ten-Ichigo in 1945. The 2199 movie Ark of the Stars will premiere the weekend before the anniversary of Pearl Harbor, which in Japan would be December 8, an important day for reasons we’ll see later in the series. 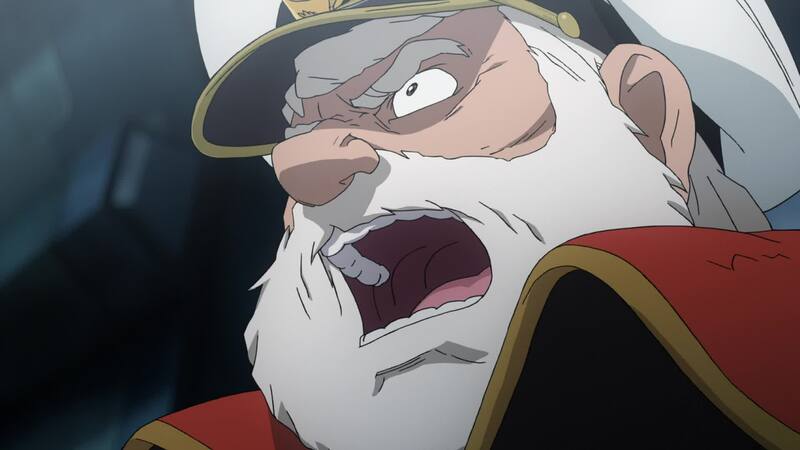 From this and the earlier discussions about time frames here and in Episode 1’s commentary, Kirishima returns to Earth on February 10, the announcement of the Yamato mission is made on February 11, and the ship launches on February 12. This also means that the trip from Mars to Earth took Kirishima about three days, give or take a day depending on how literal the “three weeks later” was. [LC]: In this final sequence, we find the biggest mix of scenes from the original episodes 2 and 3, both visually and musically. 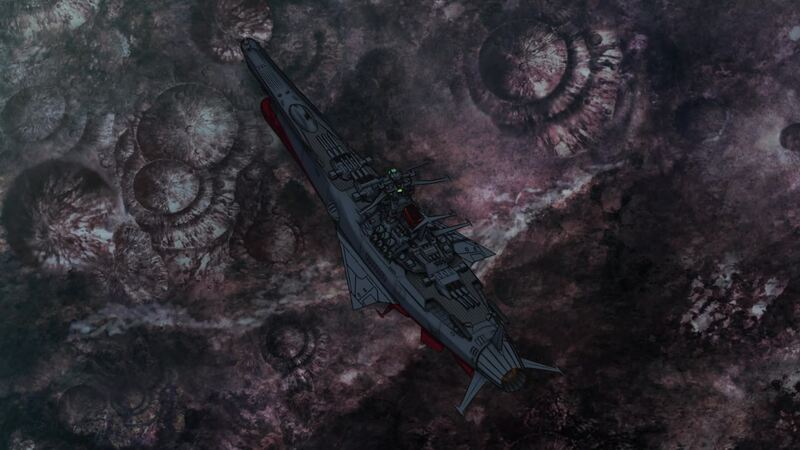 Yamato shedding its rusted skin is from Episode 2, as it takes off to attack the Pormelia. 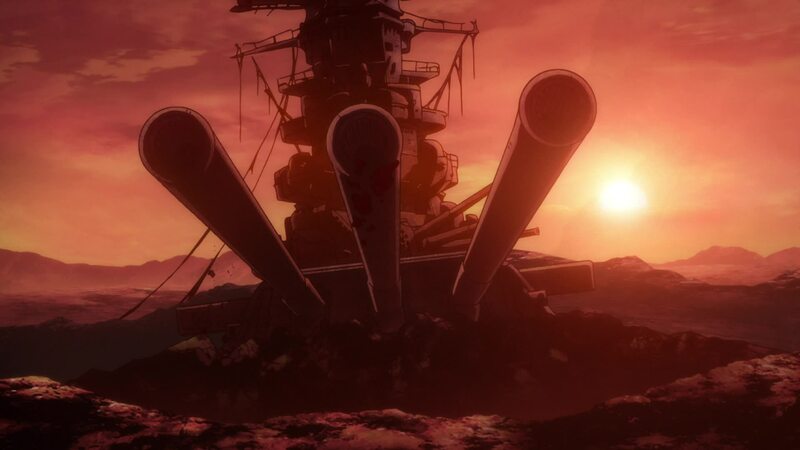 That particular scene was set with two music cues, Assembling The Fleet, played as Yamato breaks free of the Earth (an odd choice as it is typically associated with Garmillas), and Pathetic Yamato, when the ship is fully revealed and takes to the skies. 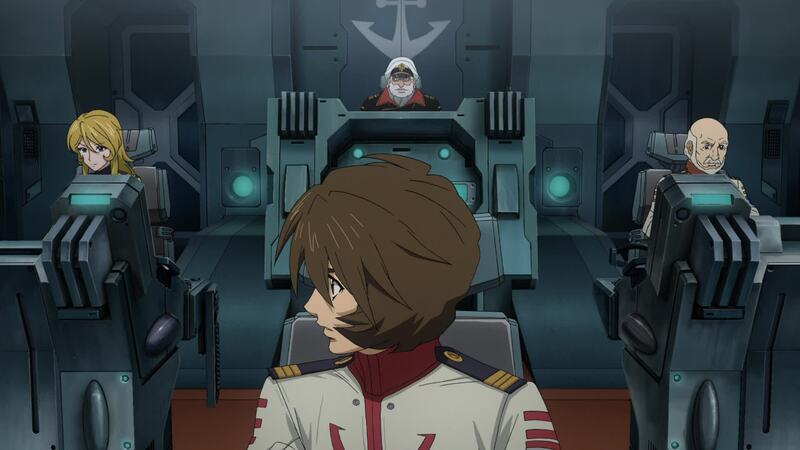 The cue used in 2199, originally called Big River – Yamato Theme and renamed Theme of the Yamato Saga for 2199, was used during the final scenes of Episode 2. More on this scene and music shuffling after the break. As the missile makes its final approach, the shock cannons are fully powered at carefully aimed. As the behemoth bears down on them, targeting systems lock on and Okita gives the order. All gun turrets fire in unison, hitting their target. The massive explosion engulfs the ship. [LC]: As with many other sets, the iconic main bridge set was entirely built in 3D and painted digitally. The same model is used throughout the series. A virtual camera was positioned as needed and printouts were made to sync up the character animation. 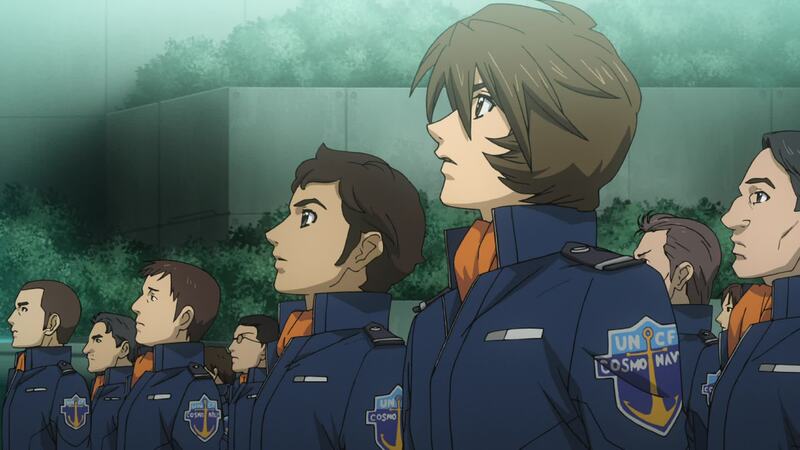 [LC]: In the original Episode 3, when they finally get the engine started and Yamato takes off… again. As if the scene wasn’t repetitive enough, they use the same music cue as in 2, Assembling The Fleet. 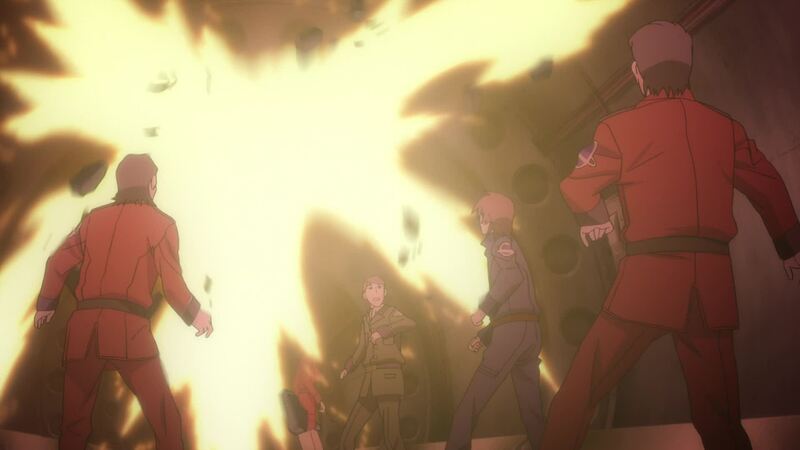 As Yamato is engulfed by the IPBM’s fire ball, Yamato Launches From The Earth starts playing until the episode closes. 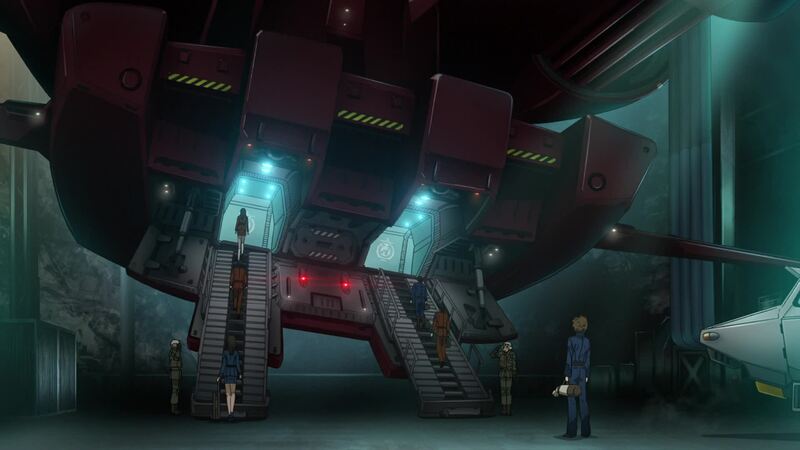 The same cue, renamed Yamato Departs the Earth is used in this corresponding scene. At HQ, the main screen comes back on but all they can see is a plume of smoke and blazing ash. 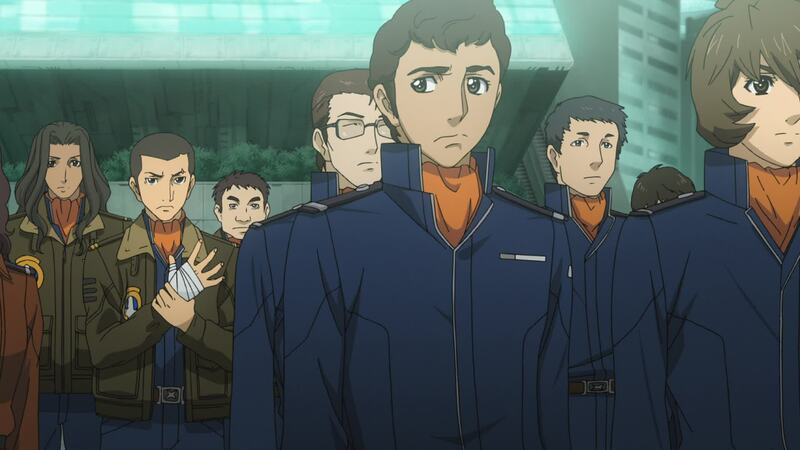 Serizawa wonders if Yamato was melted in the blast. 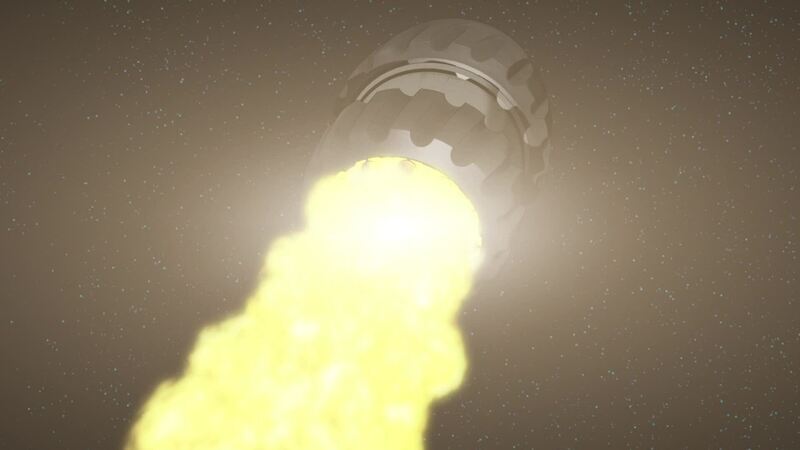 But soon, the mighty ship emerges from the cloud, unscathed, spreading its stabilizer wings as it rises into space. [DG]: Serizawa, Serizawa, Serizawa…seriously? Let it go. Sanada orders the Wave-Motion Shields to be deactivated, and Ota sighs in relief. 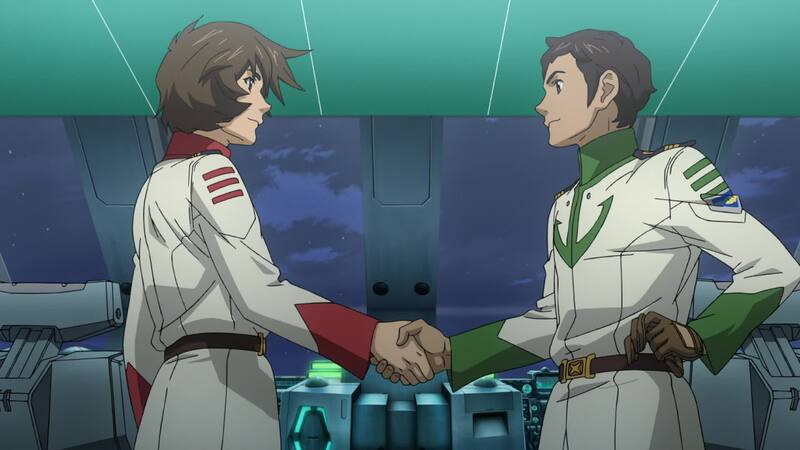 Okita commends Kodai for his work and Shima tells him to brighten up as he offers him a handshake before the smiling crew. 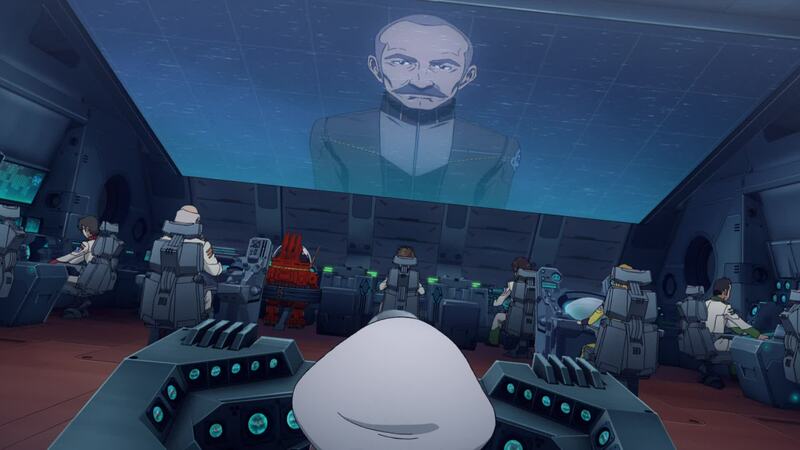 At HQ, chief Todo looks hopefully on as Yamato sets out on its long journey. [LC]: The Wave-Motion Shield (or Barrier, in some translations) was developed by Sanada based on the properties of Wave-Motion Energy. It’s a system that creates a magnetic energy field on the surface of the ship to protect it from positronic beams and live cartridges. It’s also possible to concentrate the output over one section, such as the bow, and increase its effectiveness. In story terms, it provides a convincing way to explain Yamato‘s great resistance, even when fighting overwhelming odds and taking heavy fire. But as we’ll learn, despite the shield’s usefulness, it is far from invincible. (1) The mention of the Wave-Motion Shield. Although we don’t see the shields engaged, we can assume they were activated off-camera. 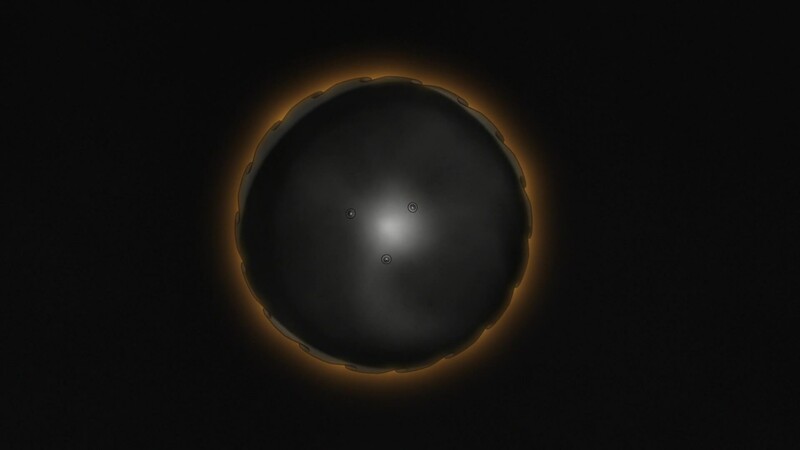 Shields were seen only once in the original series (Sanada’s out-of-nowhere reflection shield in the final episode), but their inclusion here is hardly surprising, given that energy shields are a staple of science-fiction. 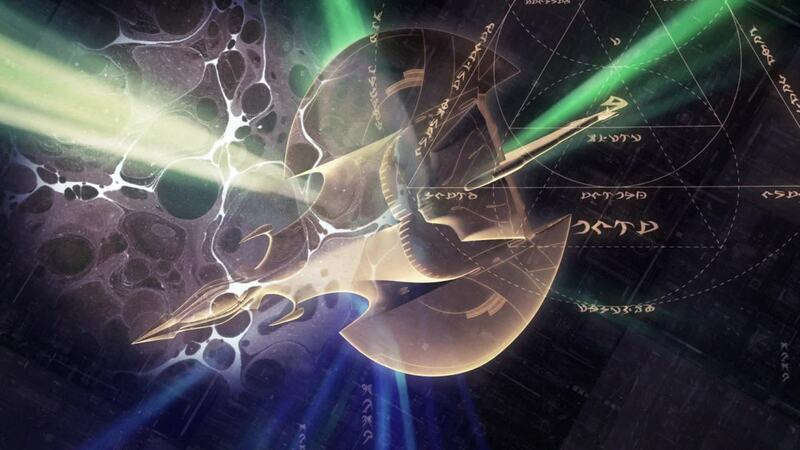 If they can power weaponry from the energy, why not a defensive shield? 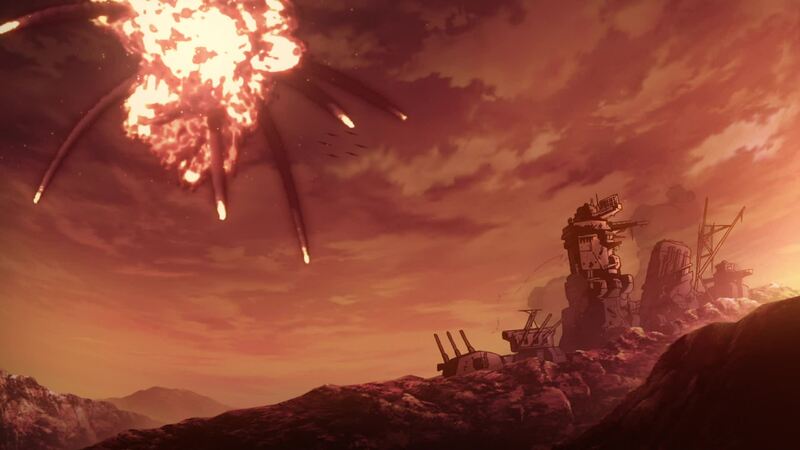 (2) The music as this final scene transpires – Yamato Launches From the Earth (2199 OST 1, Track 17) – is the same piece that played in the original Episode 3 from the moment of the missile’s destruction to the end of the episode. This is a very nice fusion of the piece from the original mono soundtrack, and the Symphonic Suite’s Take Off, which added some woodwind depth while keeping the original’s brass/strings emphasis. I always thought this piece of music was overused in the original series, but in 2199 they use it sparingly, as a marker for certain milestones in the journey. However, they only use part of it at any one time; we do not hear the entire track from start to finish once. But it when they do use it, they make the most of it. 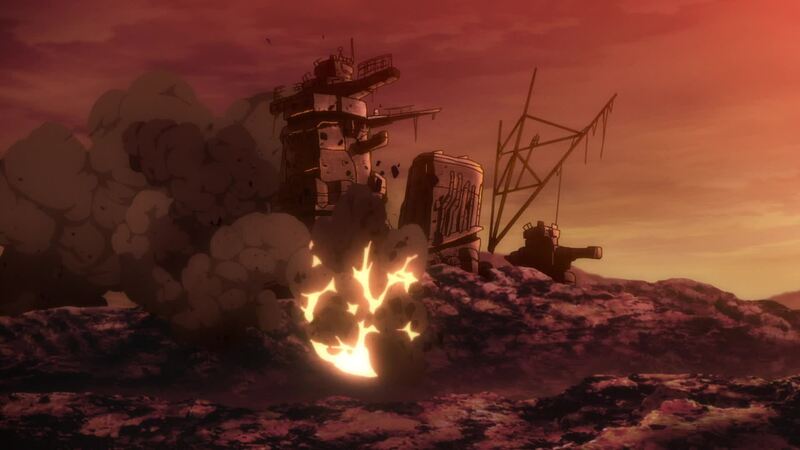 [DG]: The episode finishes with the infamous scene of Yamato emerging from the blast cloud of the IPBM (which almost got the original director Noboru Ishiguro fired because of its extravagant cost). No such worries this time around; while Ishiguro spent valuable time on a week-to-week animation schedule experimenting with untested techniques, series director Yutaka Izubuchi and episode director Akihiro Enomoto had almost four decades of anime to go on. While their schedule was not luxurious by any stretch of the imagination, they did have more time to produce the episode than Ishiguro did in 1974. The time has come to set sail. 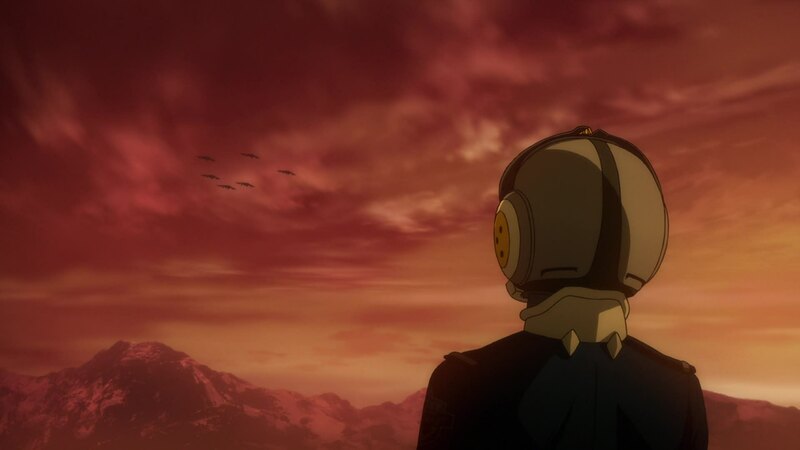 Yamato heads for the planet of hope. You… You are the only ones who can save Earth! Cross the light barrier and fly, Yamato! 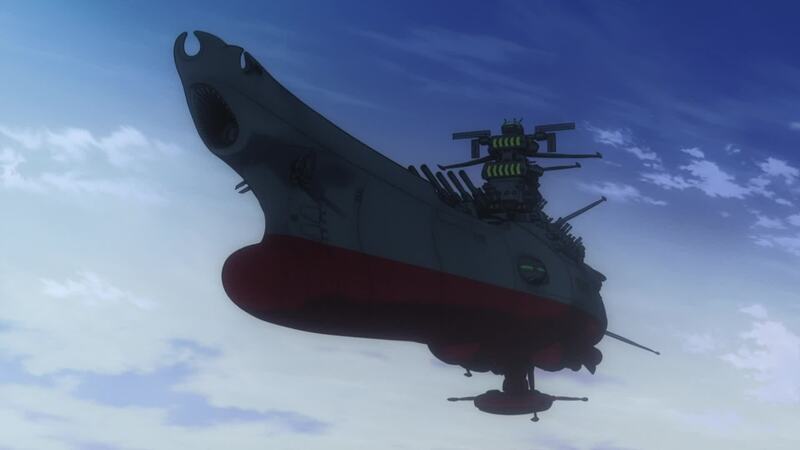 And now, Yamato’s true form is revealed. What terrifying power does it hold? 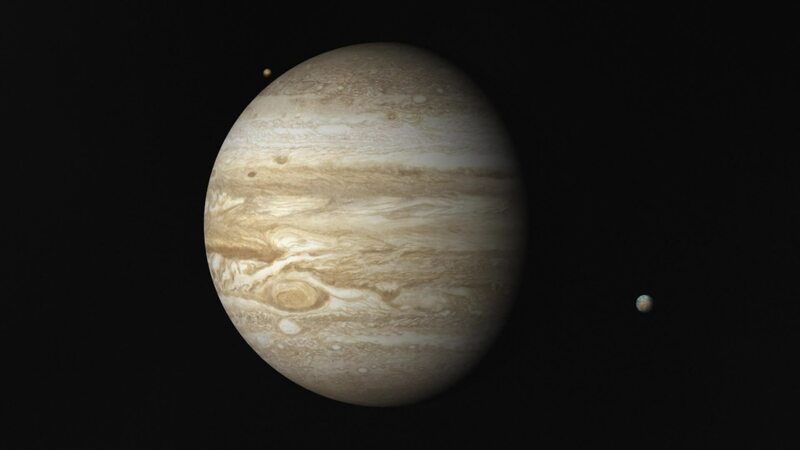 Next time: Escaping the Jupiter Sphere. There are 364 days left before humanity becomes extinct. 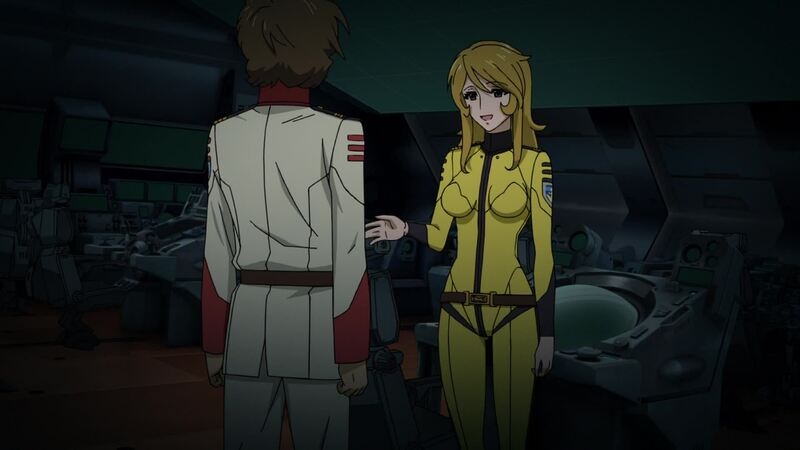 This entry was posted in Yamato 2199 Commentary by TimEldred. Bookmark the permalink. 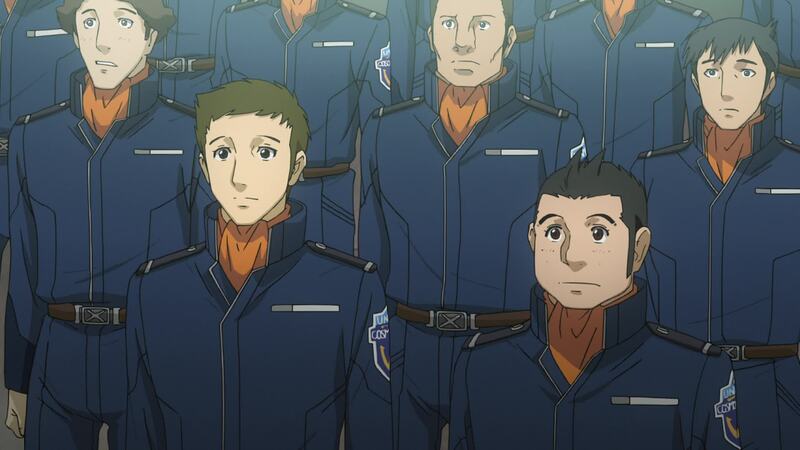 Two very, very late questions here: 1) Is it possible that Serizawa and Sanada are officers in the Cosmo Marines rather than army? 2) Any guesses what the brown uniforms represent? Are they a different branch of the Cosmo Navy? About the IPBM; why you assume that they are costly? As they presented, it seems that they are no more than precise kinetic weaponry – I.e. just REALLY large kinetic slug with engine and some guidance system. In compairson to warships, they are fairly cheap – the most costly part is an engine, and since such weaponry is unmanned and single-use it seems that relatively cheap fusion torch drive is used. The goal of said weapon is to strike the target with somewhat more precision than average planet bomb (uncontrolled asteroid) – no more. Have some IMHO theory which could work pretty nice. We don’t know, how long ago the “Yamato” was laid up. We could safely assume, that this would take at least a few years, to build the hull of such size. Doubt that this could be done in just the last year, since Iskandarian visit – more likely, the “Yamato” was initially ordered as part of “Izumo” plan. 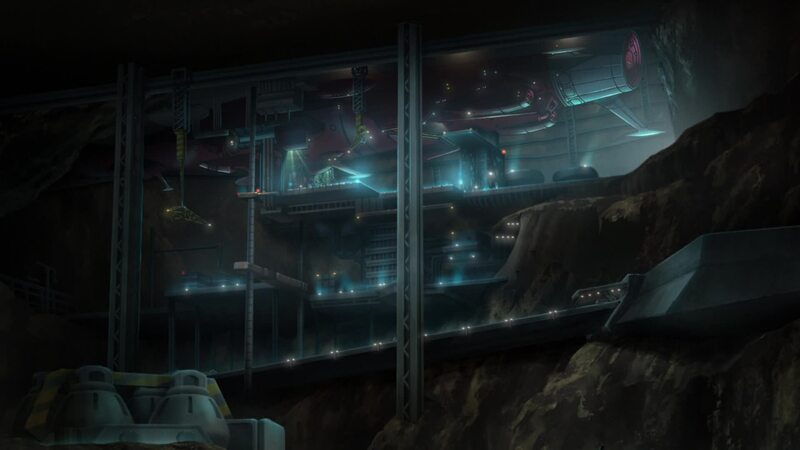 What it – when “Yamato” was laid up – his building place (which is former seafloor) was actually an underwater sea floor? 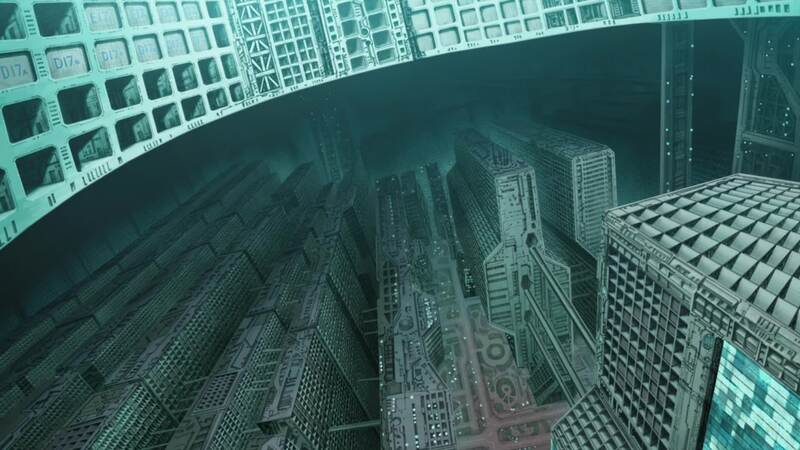 To build such ship underwater – when Earth still have oceans, of course – would make perfect sense. The water is quite effective sensor screen; unless the Garmillans actually land and start to use acoustic sensors, they hardly could detect the shipyard on the seafloor. But the engineers probably underestimated the scale of Garmillans bombardment. And suddenly they understood, that their still-incomplete ship would not be covered by water for long! So, they hastly decide to half-sunk the ship in mud, and camouflage the outside parts as old wreck. Again, make sense: just the magnetic anomaly with no obvious metal around could attract Garmillans curiosity, while the old wrecked battleship would be completely uninteresting object for them… as long as the “Yamato” engineers could camouflage the energy emissions from the hull well enough.